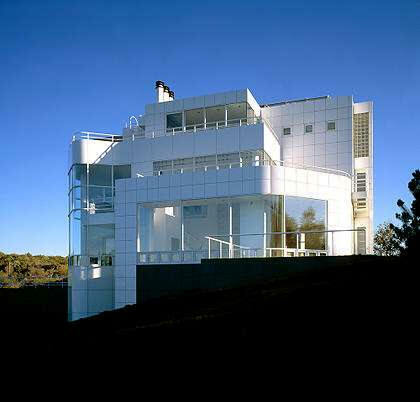 Born in Newark NJ, Richard Meier studied architecture at Cornell University. 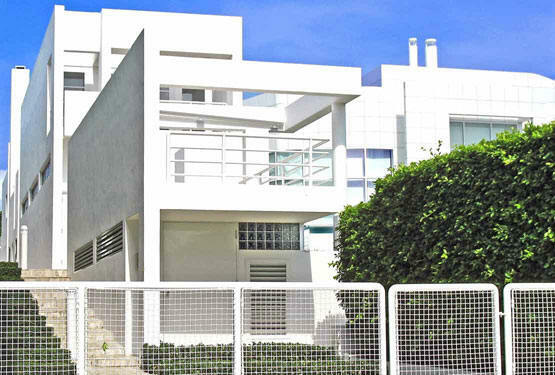 He tried to join the office of Le Corbusier, but the Swiss-French architect wasn't hiring Americans, jealous of so many winning international design awards. 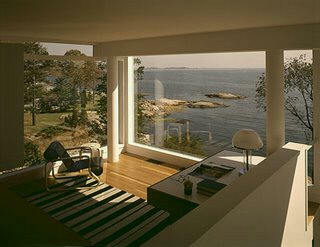 Meier worked briefly for Skidmore Owings & Merrill then for Marcel Breuer. 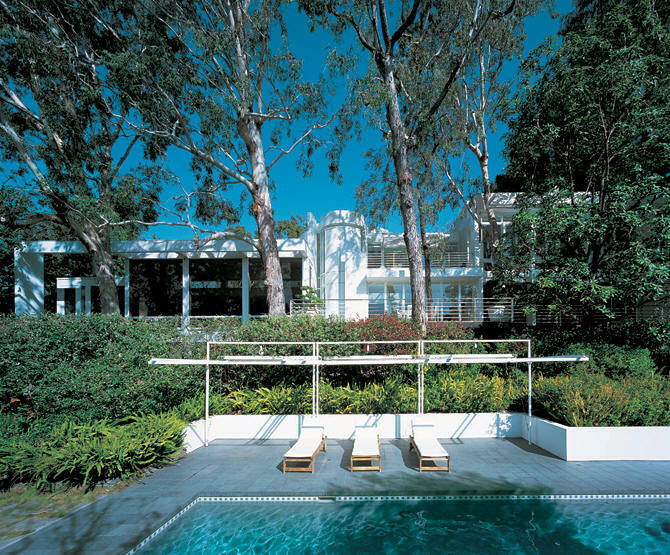 He set up his own office in 1963 and has been an icon of architecture ever since. 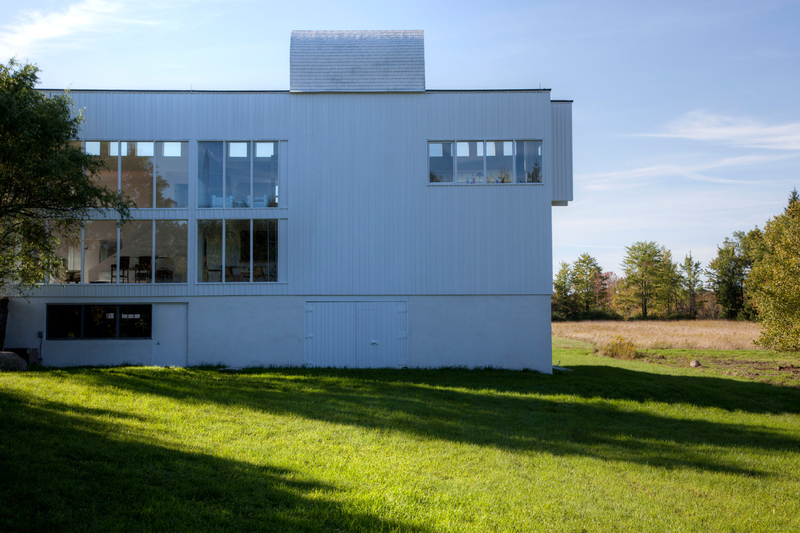 He was one of the New York Five (with Charles Gwathmey, Peter Eisenman, Michael Graves, and John Hejduk) who dominated avant-garde American architecture in the 1960's. 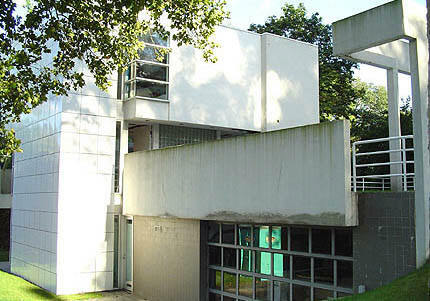 The five architects were the subject of CASE (Conference of Architects for the Study of the Environment) meeting held at the Museum of Modern Art in 1969 and a book published in 1972. 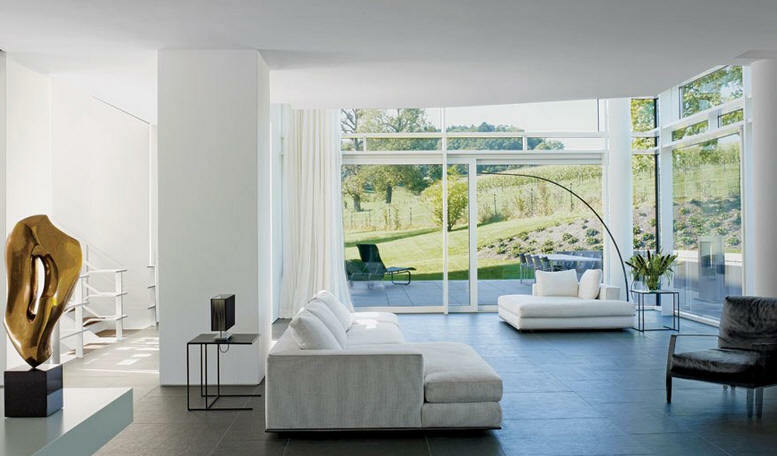 In 1984 he became the youngest recipient of the Pritzker Prize for Architecture. 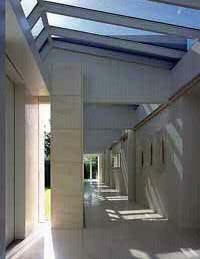 In 1989, he received the Royal Gold Medal from the Royal Institute of British Architects. In 1993 he received the Deutscher Architektur Preis, and in 1992 the French Government awarded him the honor of Officier de l’Ordre des Arts et des Lettres. In 1995 he was elected as a Fellow to the American Academy of Arts and Sciences. In 1997 he received the AIA Gold Medal as well as the Praemium Imperiale from the Japanese Government. There are many, many more awards. 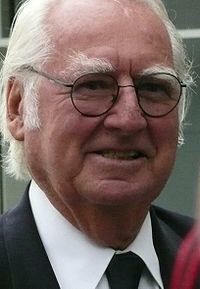 In North Carolina, he was awarded an honorary degree from NC State University in 2005. 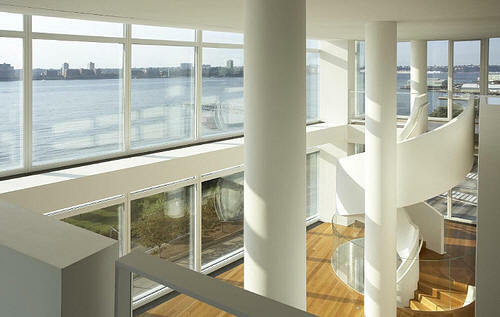 Visits to Meier's immense collection of architectural models in Jersey City can be arranged by appointment. 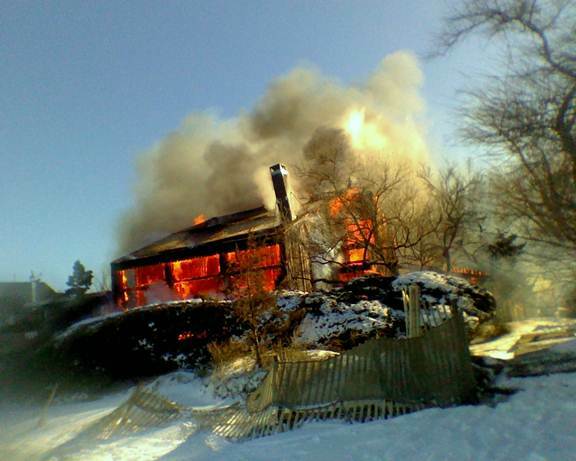 1962 - The Saul Lambert House, East Walk, Lonelyville NY, on Fire Island. 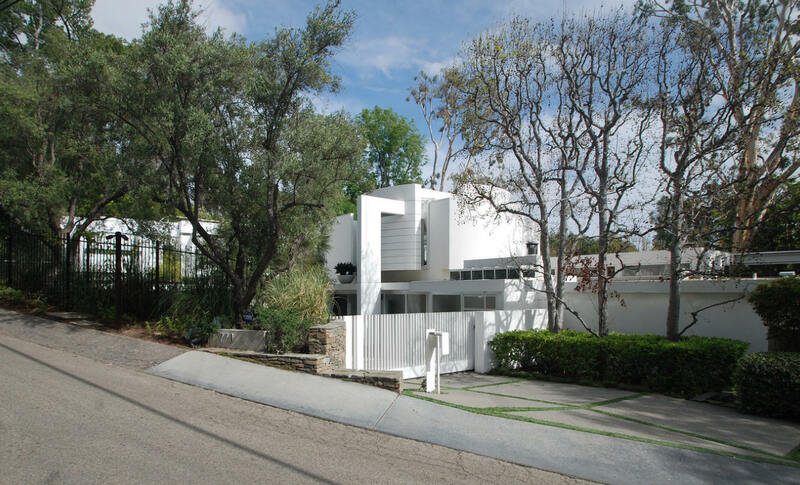 Sold to Mel Brooks and Anne Bancroft. The original design (top picture) was a prefab two bedroom house built in just under two weeks by six workmen. The Brooks added a second floor and shingled siding and turned the house into a four bedroom structure, bottom photo. 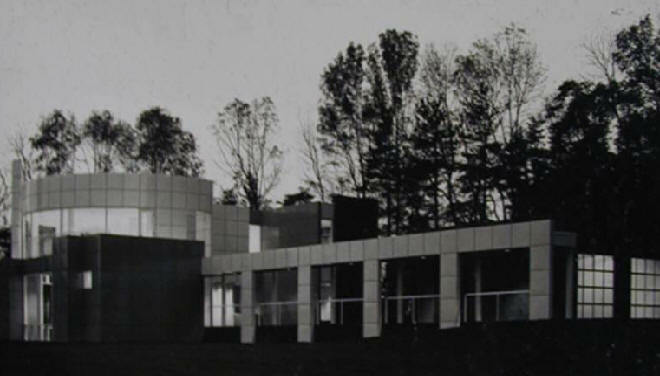 1965 - The Jerome and Carolyn K. Meier House, 183 Devon Road, Essex Fells NJ. 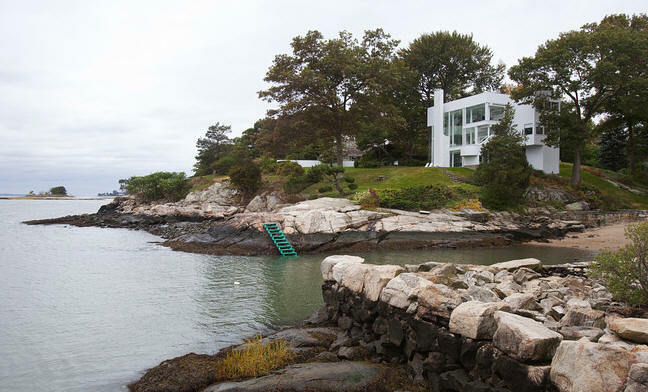 Meier's clients were "the most rewarding and the most challenging for a young architect: one's own parents." Bottom two photos by Bill Maris/ESTO. 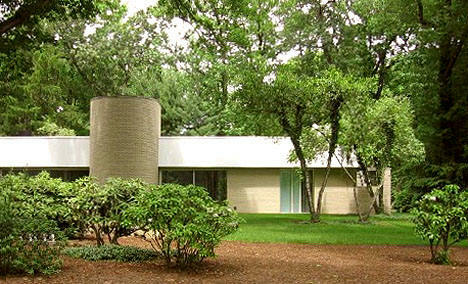 Won a 1964 Architectural Record Award. 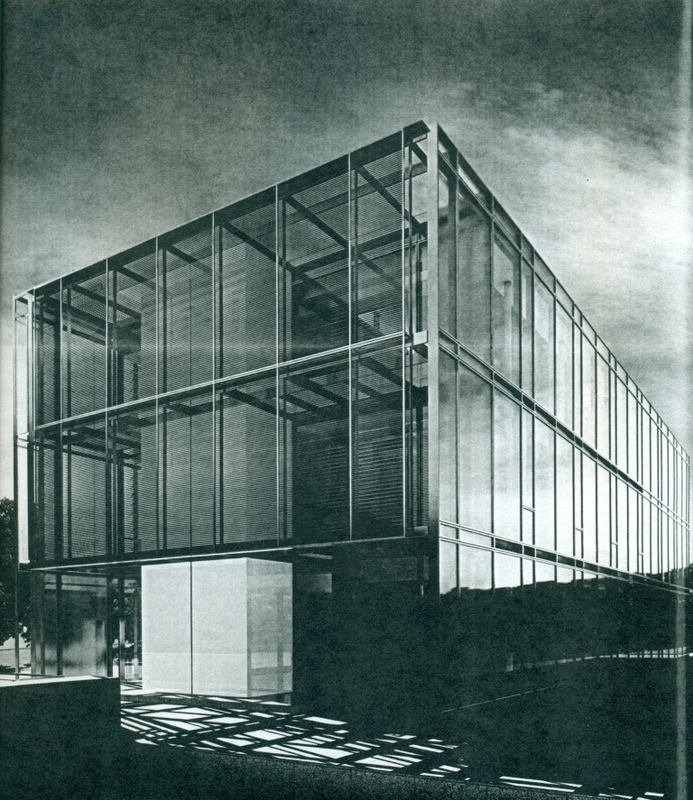 Won a 1965 AIANY Merit award. 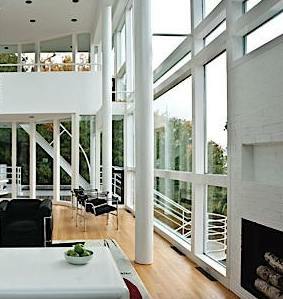 Won a 1965 National AIA Award of Merit. 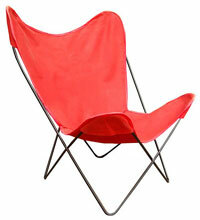 Sold in 1980 to Daniel M. and Judith Spritzer. 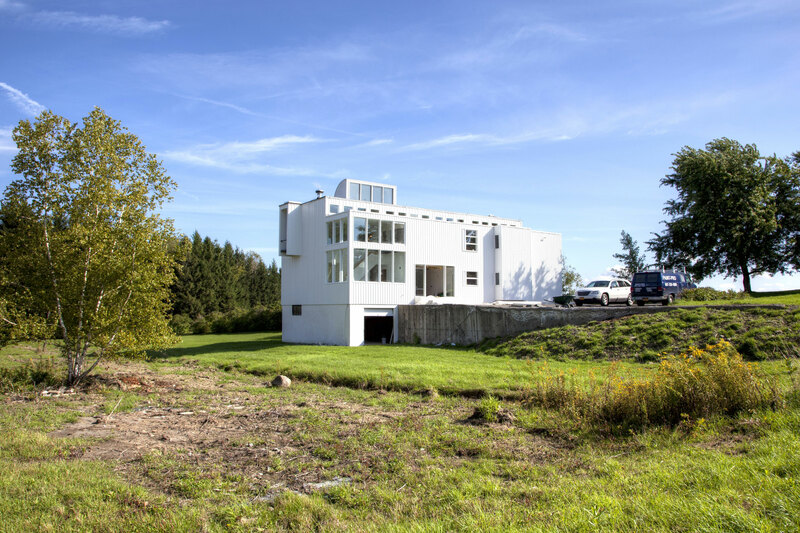 Architect Thomas Juul-Hansen did a renovation. 1966 - The Arch and Esther Dotson House, aka the Cooper-Meier House, 246 Updike Road, Ithaca NY. Designed for one of Meier's professors and his wife during Meier's last year at Cornell. The Dotsons were among the earliest in the area to experiment with solar panels. After Esther Dotson died in 2009, it was sold in 2010 to Ronald and Shelley Cooper. 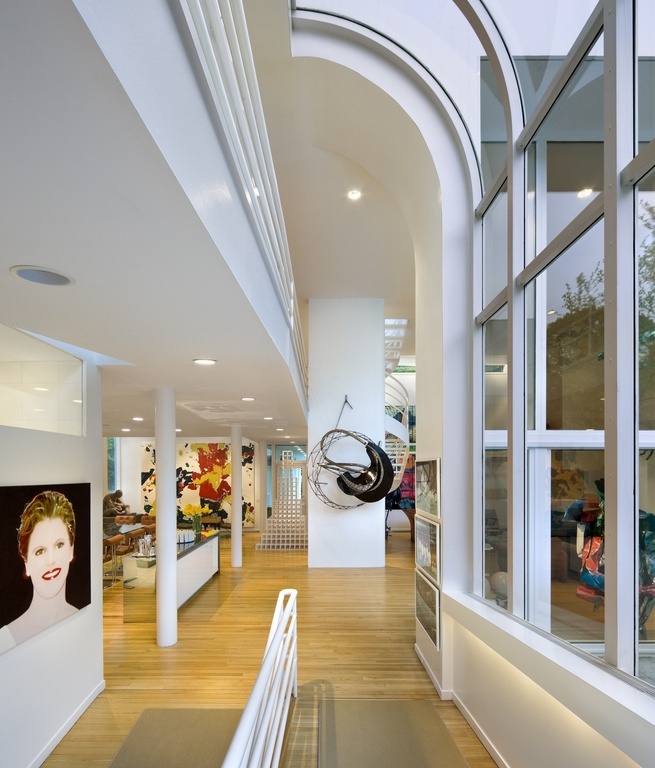 Renovated by architects Jake Rudin and Erin Pellegrino who added a gallery space in the former barn area. 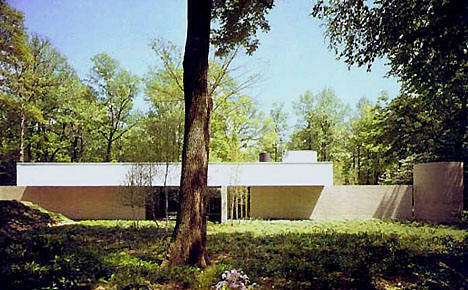 1966 - The Harold and Beatrice Renfield House Expansion, 125 Pleasant Hill Road, Chester Township NJ. 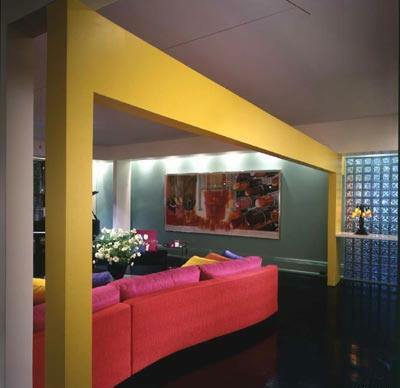 Interior design by Beatrice's friend Elaine Lustig Cohen, who recommended Meier to the Renfields. Starting with a 1930's country house bought in 1960, the property has had several additions, as evidenced by the different rooflines above. 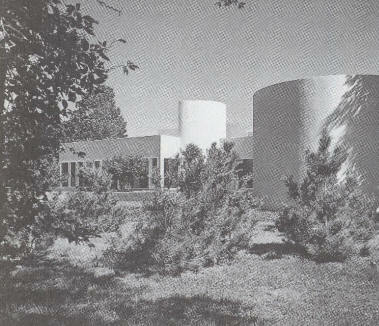 Appeared in Architectural Record, December 1968. Sold in 1992 to Alexander and Ann Marie Vella. For sale in 2019. 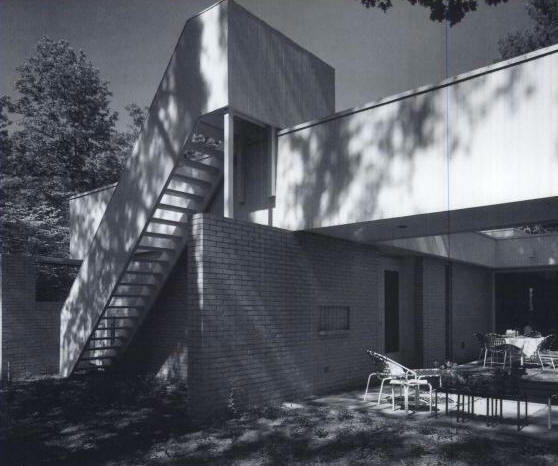 1967 - The Frederick and Carole Smith House, 16 Shennamere Road, Darien CT. Soon after the house was completed, the Smiths divorced. Won a AIA National Honor Award in 1968. 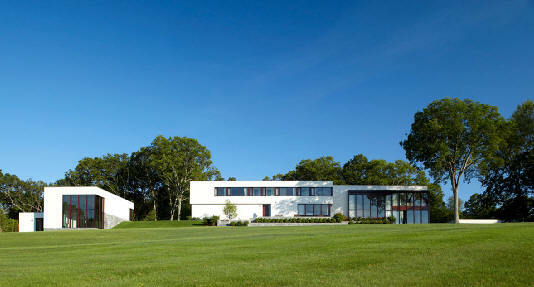 Won a 1968 AIA New England Award. 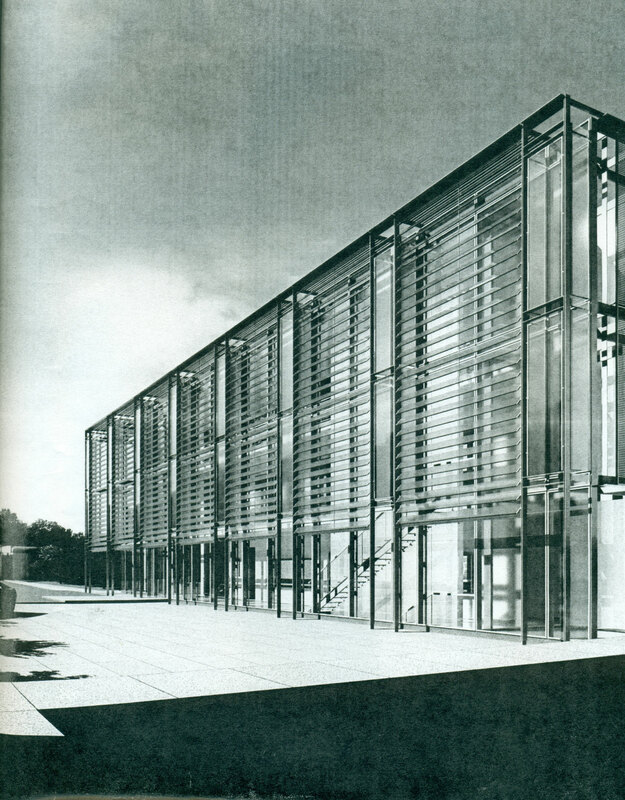 Won a 1968 AIANY Merit Award. Won a 1968 national AIA Award. 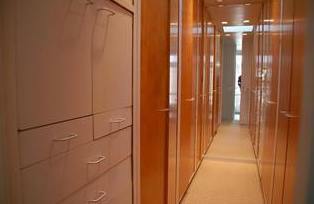 When Carole Smith later married Herrick Littlefield, Meier added 300 sf to the master suite and closets. Deeded to their son Chuck Smith. Was a rental for years. For sale in 2018. Bottom three photos by Jesse Neider. 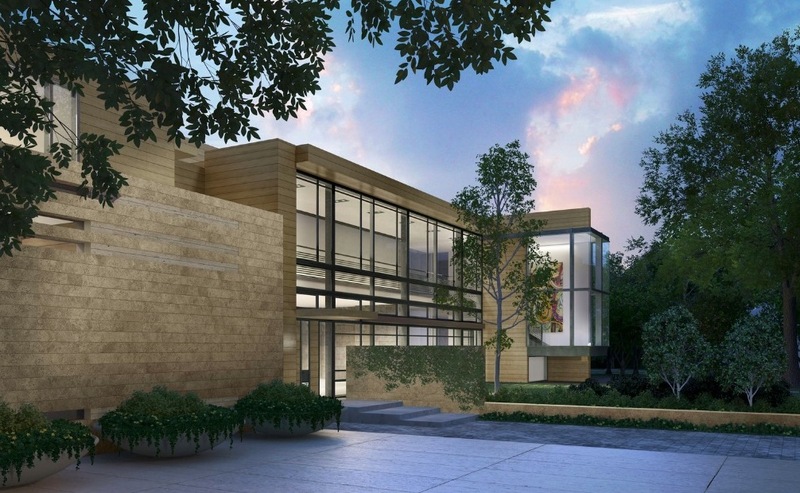 "The house capitalizes on its dramatic 1.5-acre site. 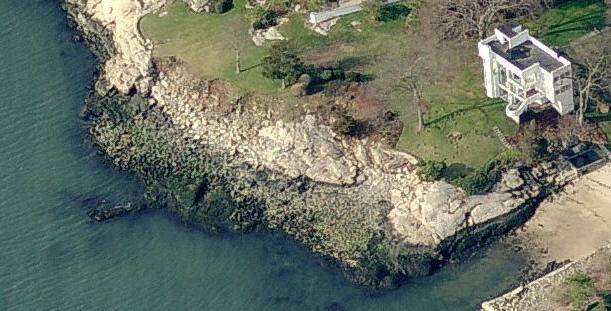 Beyond a dense cluster of evergreens, the land clears and rises to the center of the site, then drops sharply to the rugged shoreline and a small, sandy cove. The spatial organization of the house hinges on the programmatic separation between public and private areas. 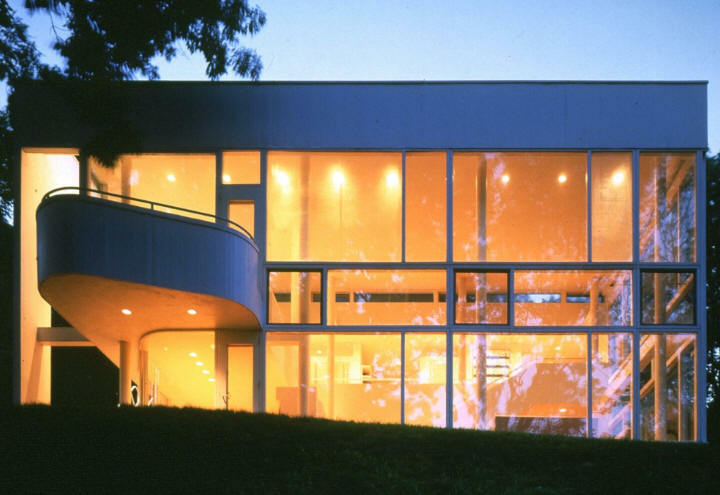 From the front walkway, visitors approach a mostly opaque white wood facade before crossing a ramp and entering on the house’s second level to discover what Meier calls a "180-degree explosion" of light and space. 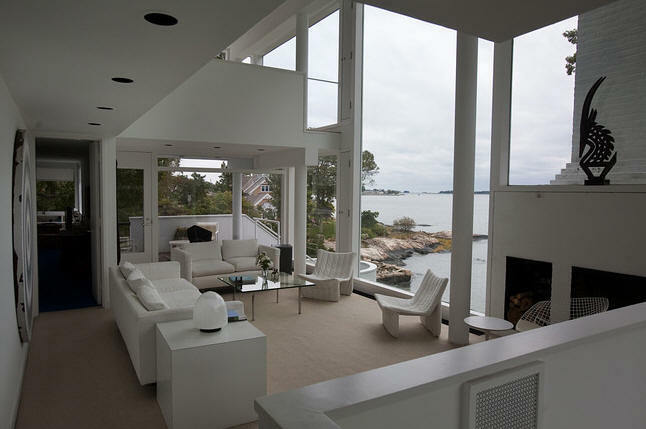 The living room, dining area, and study embrace the waterfront views, pinwheeling in a three-level enclosure of glass on three sides. 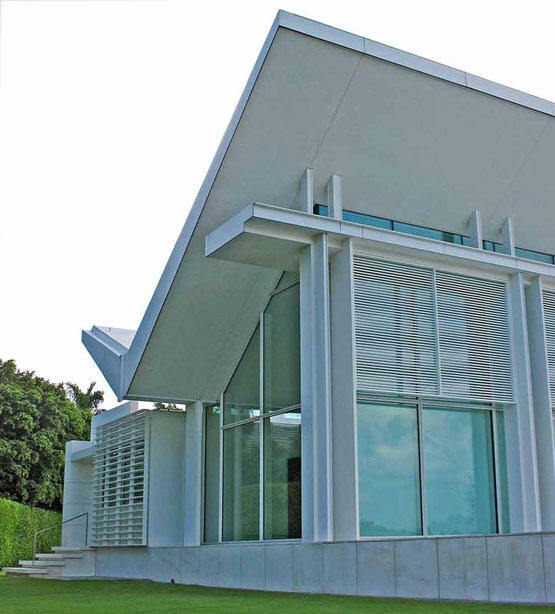 The family’s private quarters, meanwhile, are stacked to hug the street-facing facade of the 2,800-square-foot building. 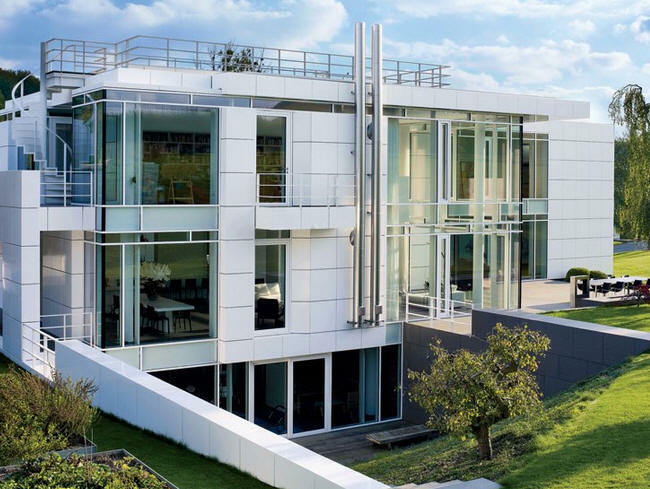 Elements that would become Meier signatures are present as well: the pristine white exterior, expanses of plate glass framed by finely proportioned piers and mullions, and minimal interiors creating intersecting volumes. 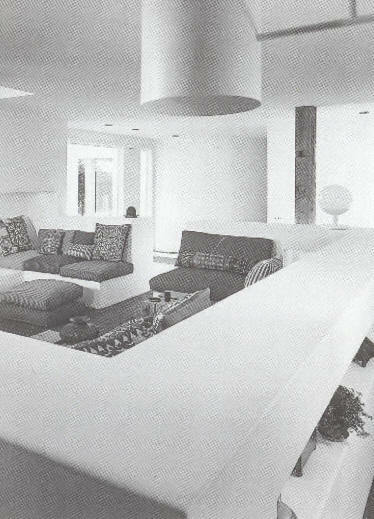 When the Smith House was published as the cover story of Record Houses in May 1968, the editors noted that "design impact is produced by the simplest means, with no frills and a remarkable absence of most current architectural clichés." 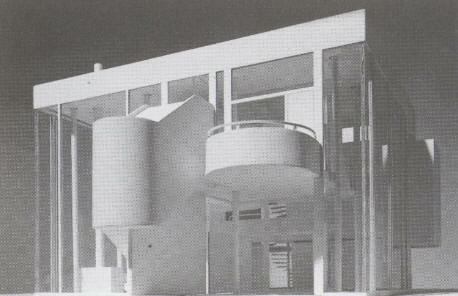 Source: Architectural Record 1968. 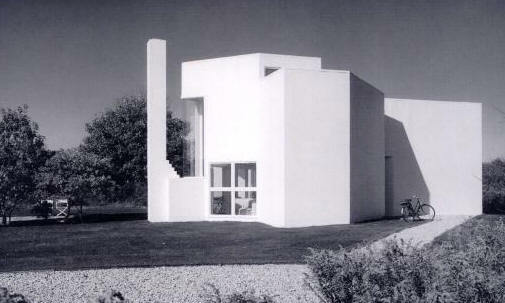 1967 - The David and Anita V. Hoffman House, 185 Georgica Road, East Hampton NY. Commissioned 1966. 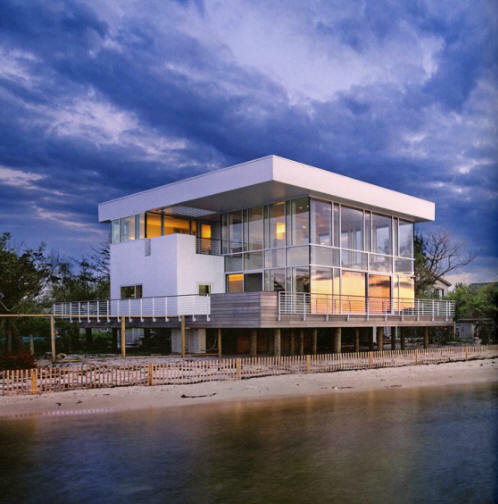 A 3000 sf addition was designed in the 1990's by architects Peter Stamberg and Paul Aferiat. Still owned by the Hoffmans as of 2009. Bottom two photos by Ezra Stoller/ESTO. 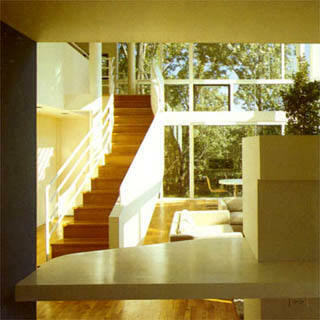 1969 - The Renny B. and Ellin Saltzman House, 20 Spaeth Lane, East Hampton, NY. Commissioned 1967. 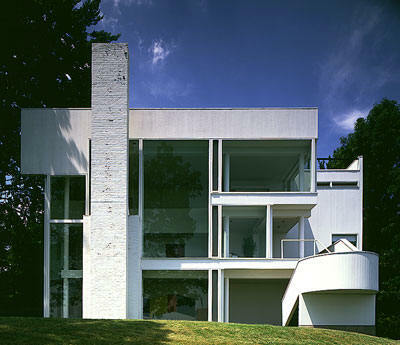 Won an AIANY Merit Award in 1972. Won a 1971 AIA National First Honor Award. 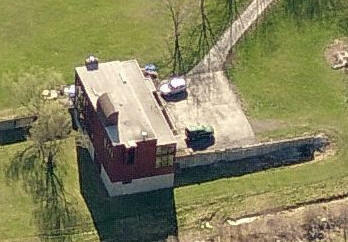 Added a pool in 2006. Deeded to Ellin Saltzman. Bottom two photos by Ezra Stoller/ESTO. 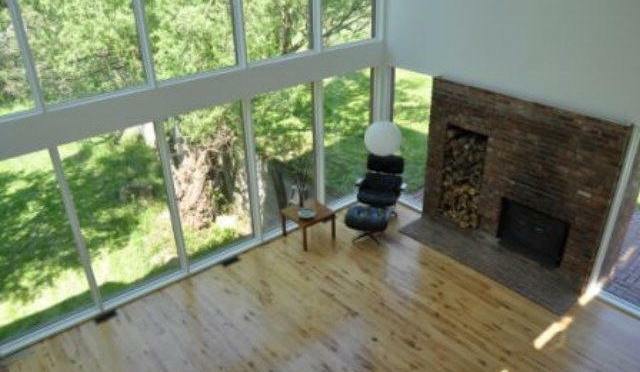 1969 - aka House in Pound Ridge NY. Unbuilt. Won an AIANY Merit Award in 1973. 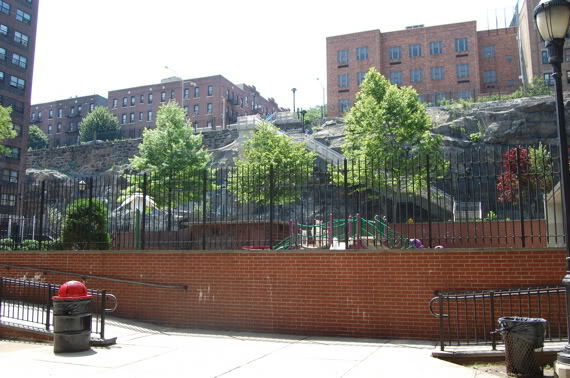 1970 - Twin Parks Northeast Housing, 735 Garden Street, The Bronx NY. Commissioned 1969. 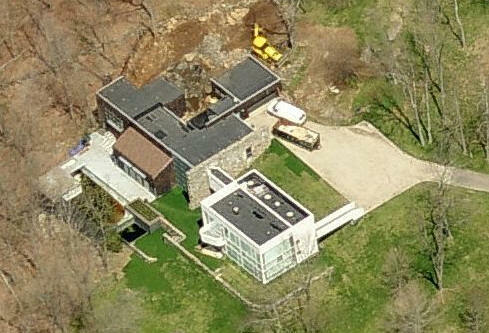 1971 - The Alvin and Joan Weinstein House, aka White Castle, aka House in Old Westbury, 73 Bacon Road, Old Westbury NY. 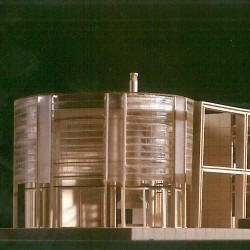 Won a 1971 AIANY Merit Award. Won a 1973 national AIA Honor Award. Sold to Charles Kelman. Sold to Irwin and Alicia Selinger. 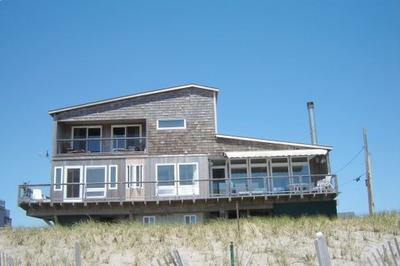 Sold in 1998 to Thomas and Alicia Murphy, Jr. Sold to Michael H. and Joan Spector, who did a renovation. B/W photos by Ezra Stoller/ESTO. Deeded to Marc Spector. Deeded in 2014 to 73 Bacon LLC (Spector). 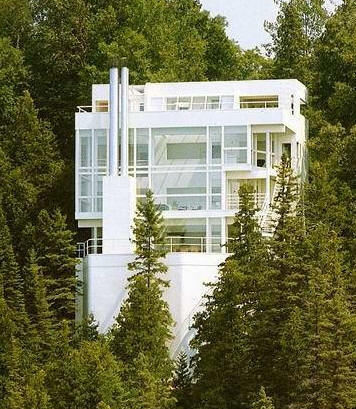 1973 - The James E. and Jean Douglas House, 3490 South Lakeshore Drive, Harbor Springs MI. Won a 1974 AIANY Merit Award. Won a 1976 National AIA Honor Award. 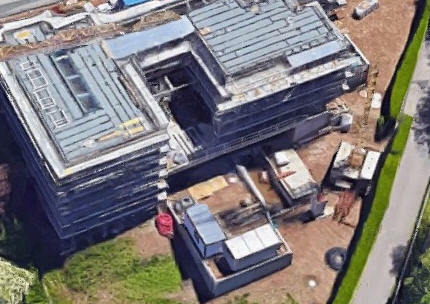 5000 sf. 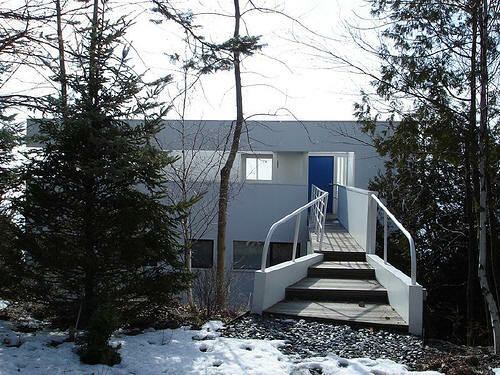 The house really should be called the "General Hitch of Canada" House as Douglas titled it to his company, according to Rod Nunn who worked with Douglas at the time. 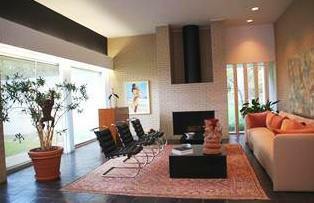 Sold in 1981 to J. M. Walstrom who added carpeting, foil wallpapers, heavy drapes, and early American furniture. 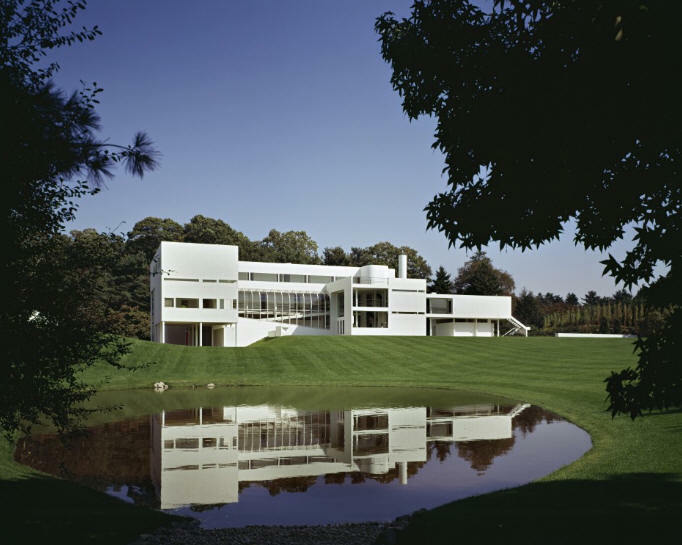 Much of the Meier-designed or specified furniture was gone or damaged, and the house, closed during winters, had substantially deteriorated. 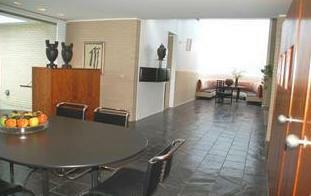 Sold in 1985 to Paul and Penny Beitler who did a restoration. 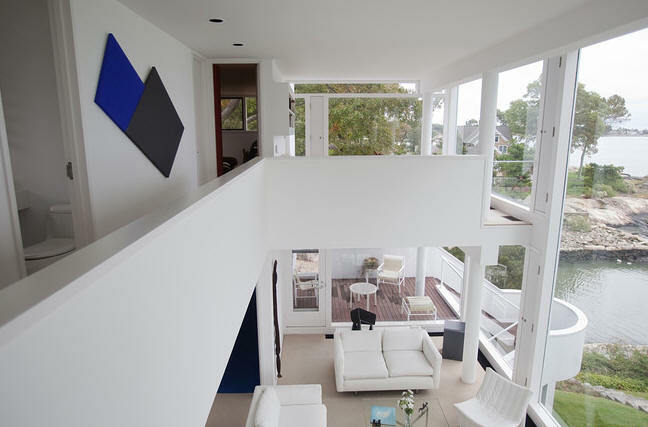 Sold in 2007 to Michael McCarthy and Marcia Myers, bottom photo, who did an extensive restoration. 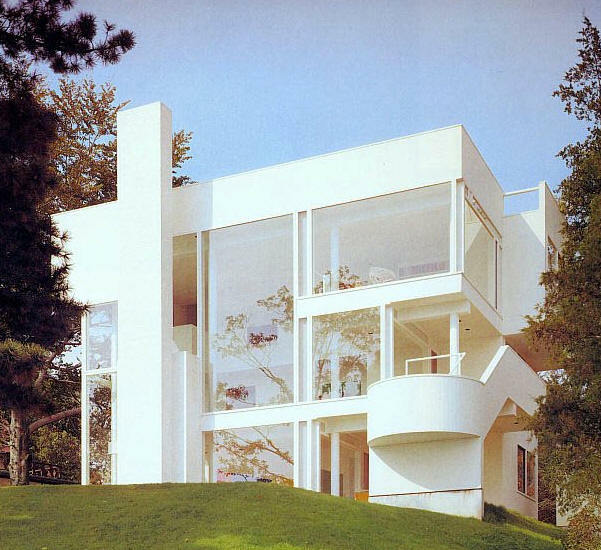 1974 - The Stuart R. and Paula Shamberg House, aka House in Mount Kisco, 46 Old Roaring Brook, New Castle NY. 6.5 acres. Won an AIANY Merit Award in 1976. Won a national AIA Honor Award in 1977. 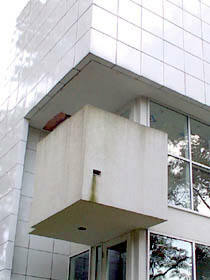 Was a 1977 Architectural Record house. Sold in 1989 to Geoffrey P. and Susan Wharton. 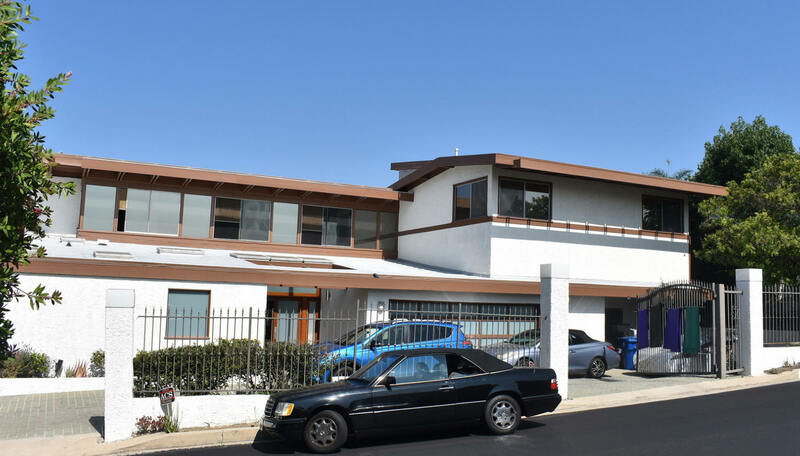 The Whartons made significant changes, expanding the original 2,700 sf house and bridging it with the adjacent building. 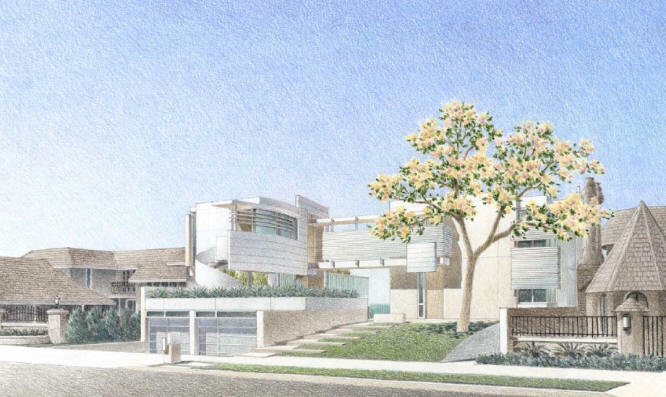 The combined 6700 sf property includes a new media/family room with three kitchens, four bedrooms, five baths, a rectangle-shaped swimming pool, a smaller reflecting pool, a two-car garage, and a separate barn/garage. 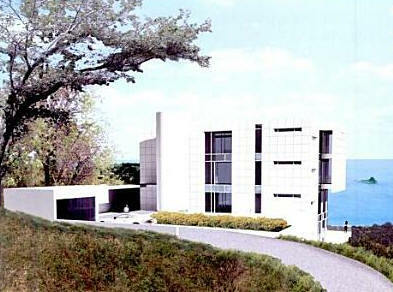 The Meier portion of the house is as originally designed except for a new stone floor and the addition of central air conditioning. For sale ten years, then sold in 2014 to Normarty Associates LLC. B/W photos by Ezra Stoller/ESTO. For sale in 2018. 1974 - The Twin Parks Northeast Housing, 365 Ford Street, Bronx NY. 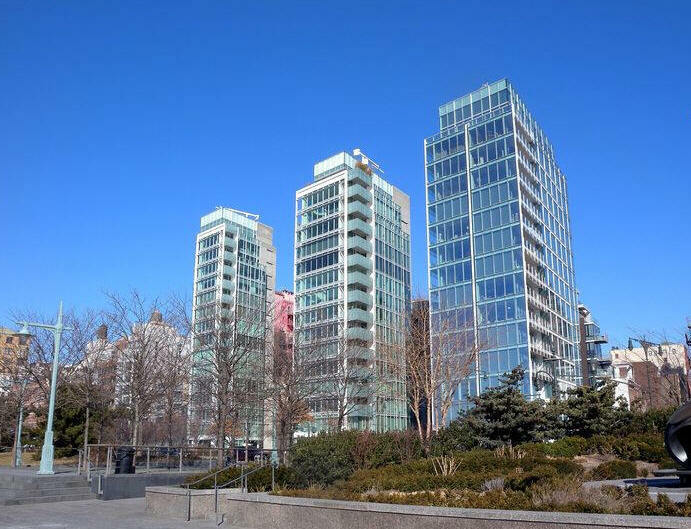 There are 312 apartments housing some 918 residents at the 4.35 acre site between East 182nd and East 184th Streets, Webster and Tiebout Avenues. 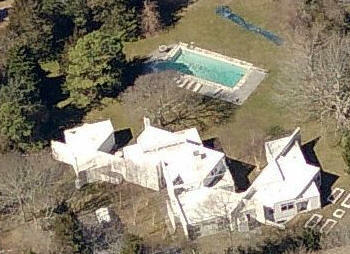 1976 - The Richard H. Maidman House, 27 Astor Lane, Sands Point NY. Commissioned 1971. Still owned by the Maidmans through an LLC as of 2017. Bottom three photos by Ezra Stoller/ESTO. 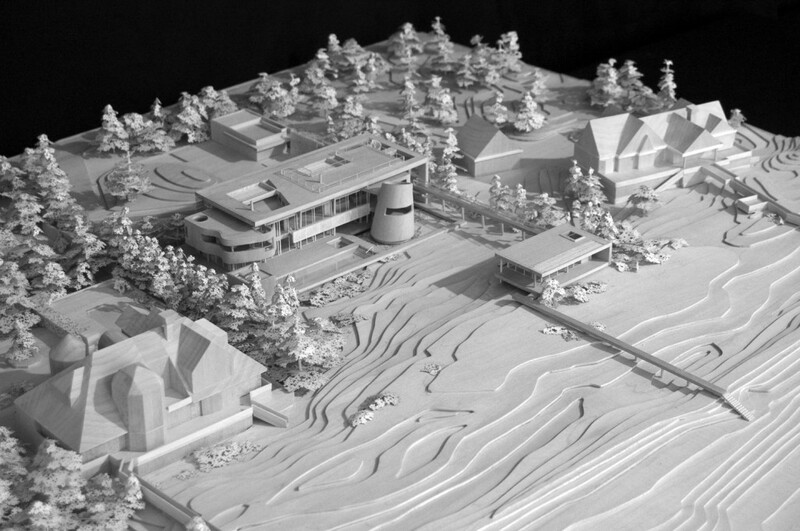 1976 - House Prototypes for Concord MA. Unbuilt. Photo by Wolfgang Hoyt/ESTO. 1977 - The Philip (Phil) and Lucy Suarez Apartment, 1 Lexington Avenue, New York NY. Photos are from the 1990 renovation by Stamberg Aferiat. Featured in Elle Decor, February/March 1992; Casa Vogue, February 1992; House Beautiful, December 1998; Food and Wine, May 1996. 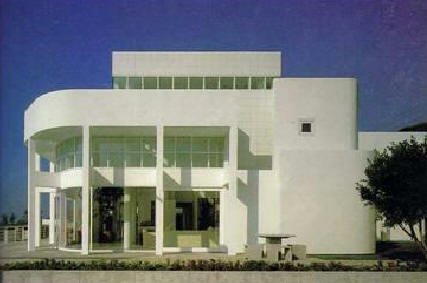 1979 - The A. Alfred Taubman Residence, aka the Palm Beach House, aka Camelot, 958 North Lake Way, Palm Beach FL. Commissioned 1977. Project architect, Stephen Lesser. 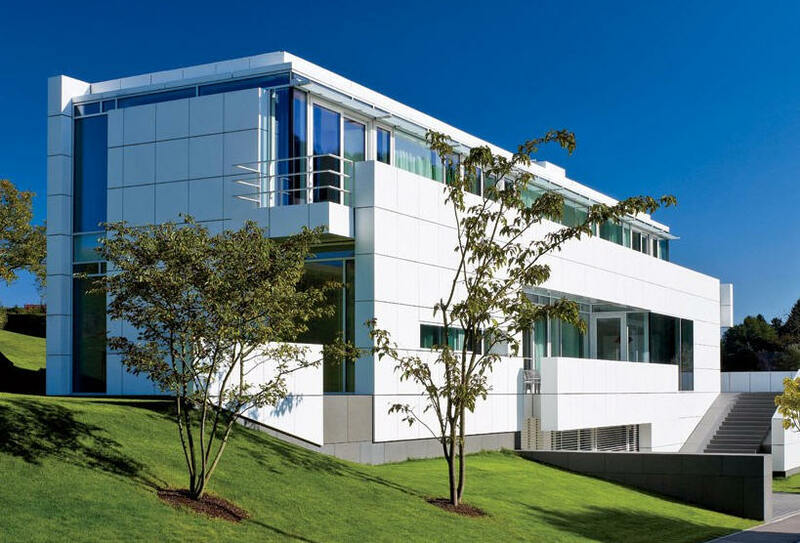 Taubman sued Meier and the builder, Robert Gottfried, and others over structural defects. The suit was settled out of court, mostly in Taubman’s favor against Meier. Sold in 1992 to David and Sandra Mack. 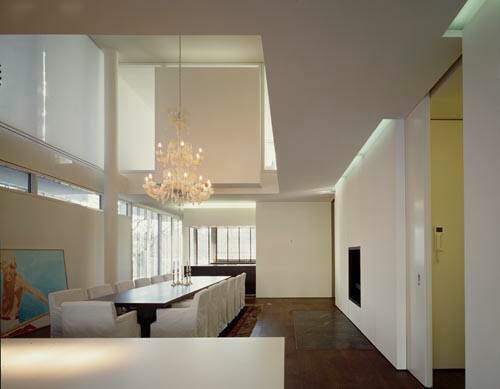 Architect Mark Stumer of New York did a 2,329 sf two-story addition in 1995. Bottom photo by Jeffrey Langlois. In May 2009, by a 4-1 vote, the Town Council declined to give the house historic landmark status. Deeded to Sandra Mack, still owner as of 2017. Bottom photo by Ezra Stoller/ESTO. Around 1979 - The Grey Apartment, New York NY. Project architect was Stephen Lesser. Unbuilt. Around 1979 - The A. Alfred Taubman Apartment, 834 Fifth Avenue, New York NY. Unbuilt. Project architect was Stephen Lesser. 1984 - The Francis A. 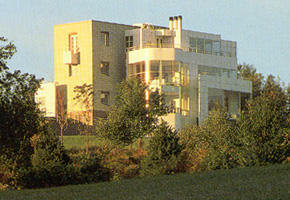 (Frank) Giovannitti Residence, 118 Woodland Road, Pittsburgh PA. Michael Palladino was the project architect. Giovannitti was the general contractor. 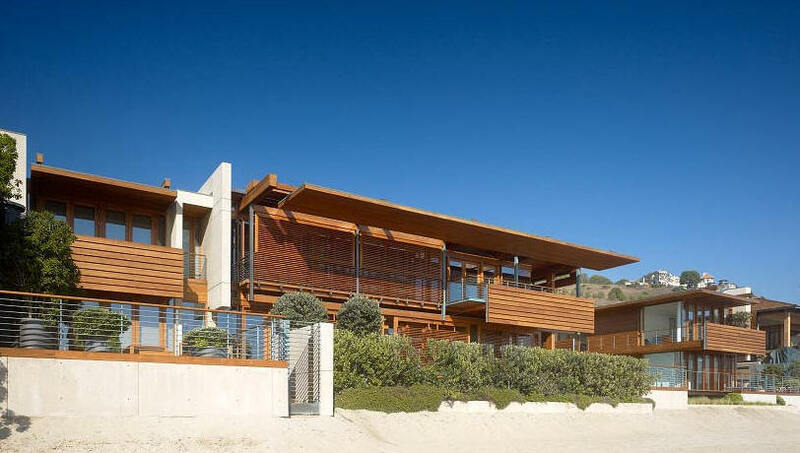 At 2200sf, one of Meier's smallest designs. 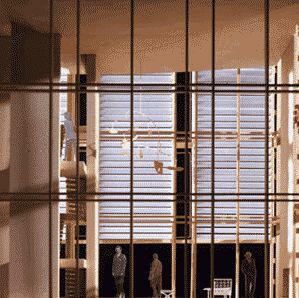 Won an 1985 AIANY Merit Award. Top color photos by George Smart. B/W photos by Ezra Stoller/ESTO. Bottom color photos from 2011 by Roy Engelbrecht. 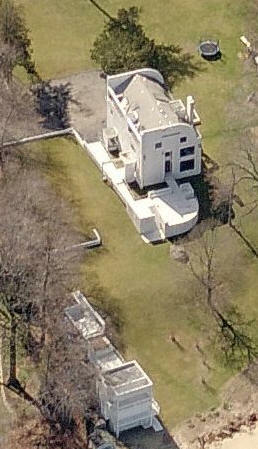 At 118A, next to this house, is the Abrams House by Robert Venturi and Denise Scott Brown, aerial photo. 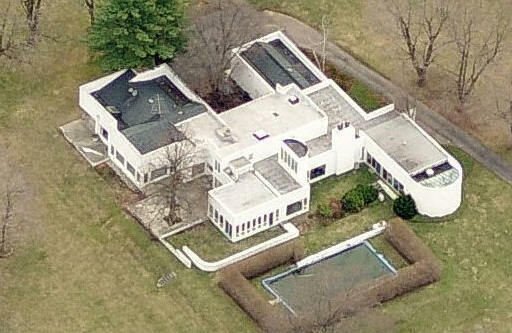 Sold in 2017 to William and Patricia Snyder who bought the Abrams House in 2018 and plan to destroy it to expand the Meier house property. 1984 - The Helmick House, Des Moines IA. 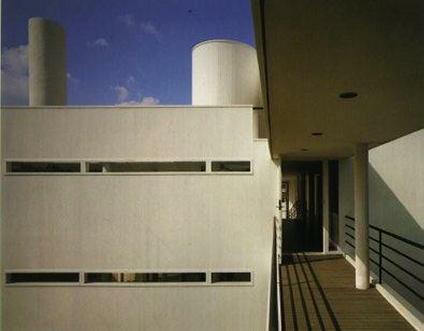 Was the first Meier work to be orchestrated around a central cylinder, similar to Charles Gwathmey. Unbuilt. 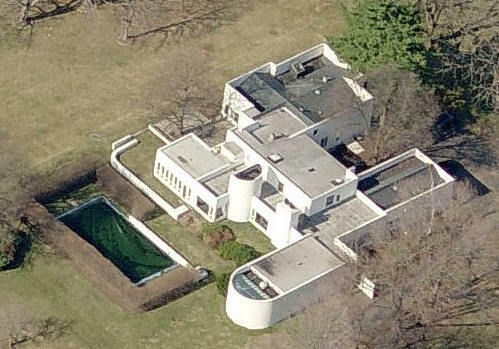 1986 - The Joel and Ann Ehrenkranz Residence, aka the Westchester House, 131 Keeler Lane, North Salem NY. Commissioned 1984. Won an AIA National Award in 1987. 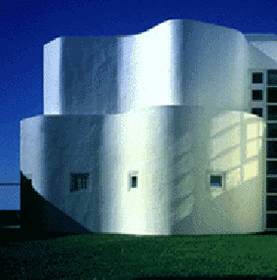 Won a 1990 National AIA Honor Award. Bottom photo by Wolfgang Hoyt/ESTO. Deeded to John B. Ehrenkranz. 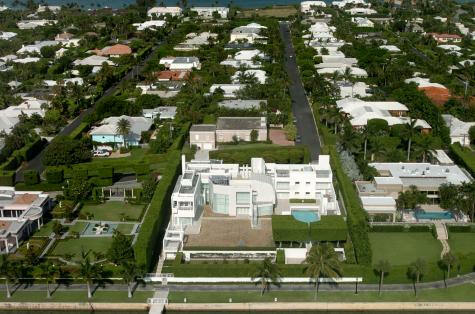 Sold in 2012 to Highfield Property LLC, controlled by John B. Ehrenkranz and Jeanne Fogel. 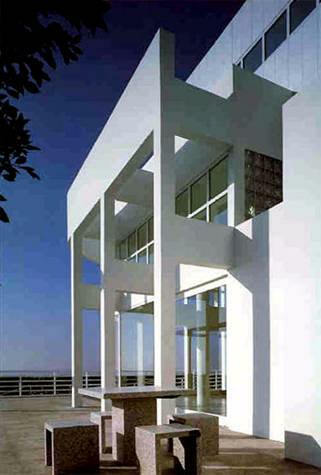 1986 - The Norman and Lisette Ackerberg House, 22466 Pacific Coast Highway, Malibu CA. 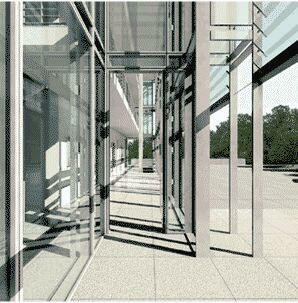 Meier did an expansion in 1994 which added another floor. Commissioned 1984. 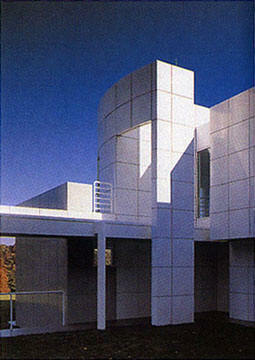 Won an AIA Los Angeles Merit Award in 1991. Deeded to the Lisette Ackerberg Trust. Sold in 2017 to Larry Ellison. 1988 - The Neil Bluhm Apartment, in the 900 North Michigan Avenue building, Chicago IL. 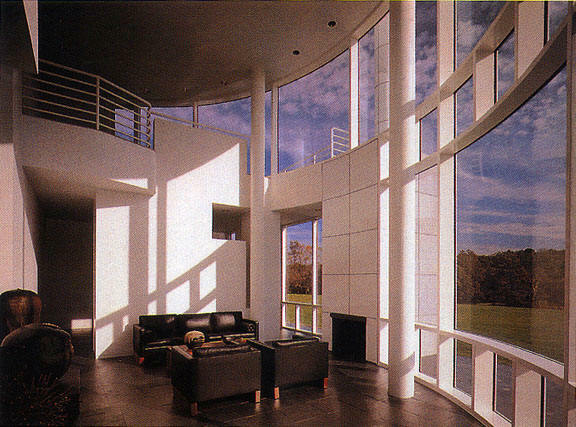 1989 - The Louis W. and Sandra Grotta, Jr. House, 46 Dicksons Mill Road, Green Village NJ. Commissioned 1984. Seven acres. Won a 1985 AIANY Projects Award. 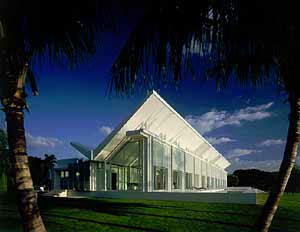 Won a 1990 AIANY Merit Award. Still owned by the Grotta family as of 2012. 1992 - House in Wiesbaden, Germany. Unbuilt. 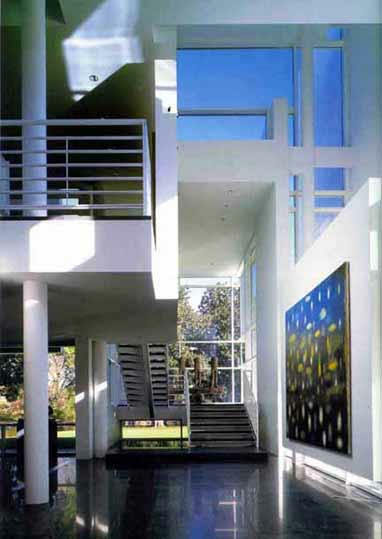 1996 - The Howard and Cindy Rachofsky House II, 8605 Preston Road, Dallas TX. 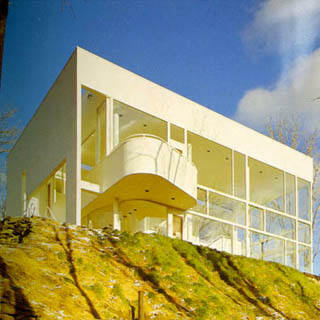 Meier also designed an 1986 house for the Rachofskys which was never built. 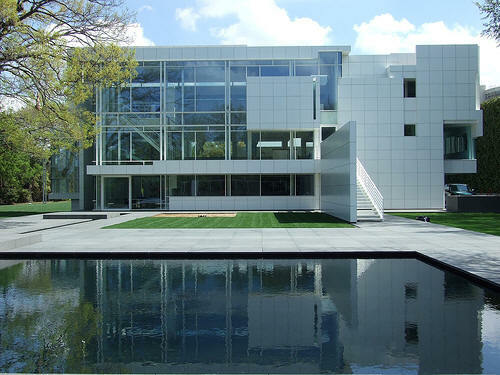 The couple left in 2005 but their massive art collection was an art museum for a time open to the public by appointment. Bottom three photos by Kevin Cundiff. 1997 - The Glasgow Exhibition House, Glasgow, Scotland. The project architect was Reynolds Logan. Beyond a few sketches, the project never got started. 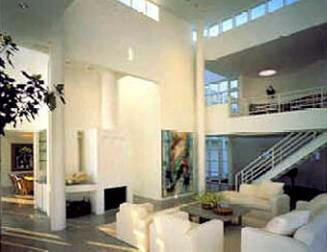 1998 - The Klaus and Ursula Neugebauer House, 3930 Fort Charles Drive, Naples FL. Commissioned 1995. Designed with Thomas Pfifer. Structural and Mechanical Engineers: Ove Arup & Partners. 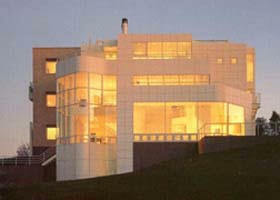 Built by Newbury North Associates. 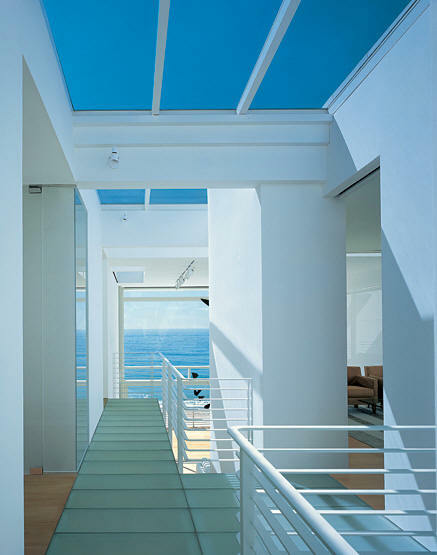 1999 - The Swartz House, Laguna Beach CA. Unbuilt. 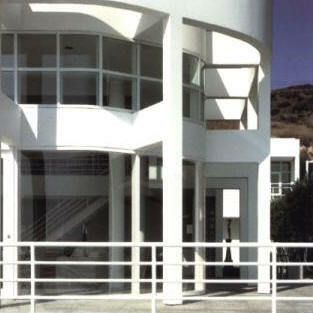 2000 - The Gilbert B. Friesen Renovation, 770 North Bonhill Road, Los Angeles CA. Original house built in 1953. 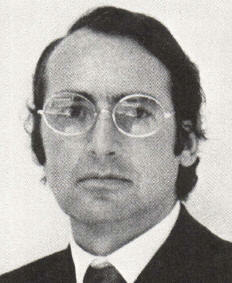 Project architect was Michael Palladino. 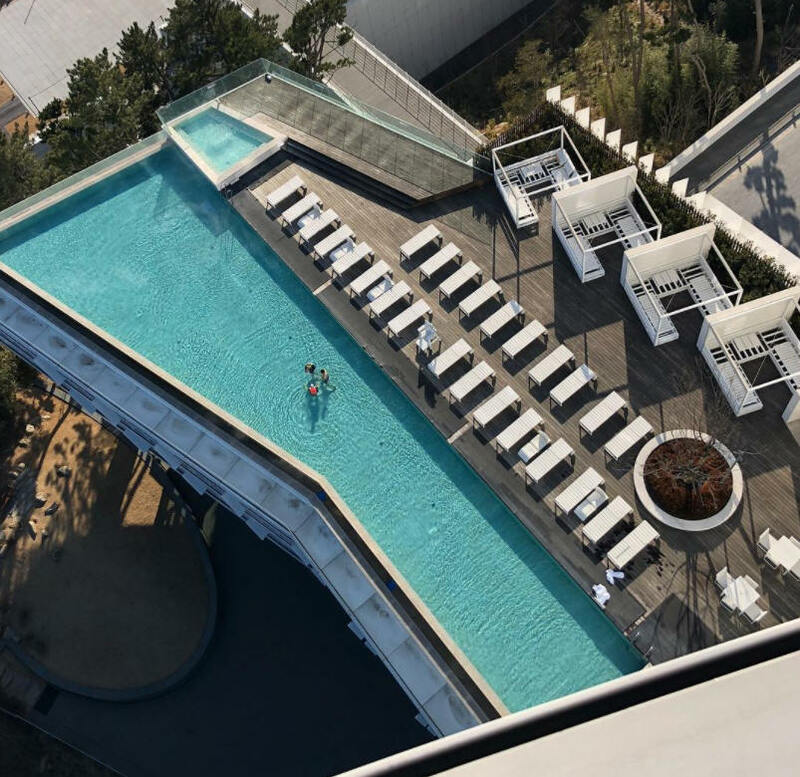 Architect Matthew Alan Flynn in 2014 remodeled the interior, adding a new rectractable roof and a detached recreation room and cabana structure. Top photo by Michael Locke. Sold in 2013 to Maggie Kayne. Sold in 2017 to Black Pine Property LLC. 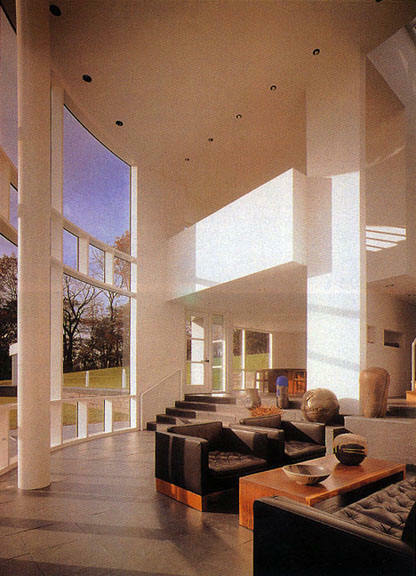 2000 - The Daniel Benton House, aka the Country House, aka Katonah House, 100 Upper Hook Road, Katonah NY.The house went through many designs, with those on the design team including James Carpenter, Rayme Kuniyuki, James Lehur, and Nilay Oza. Unbuilt. 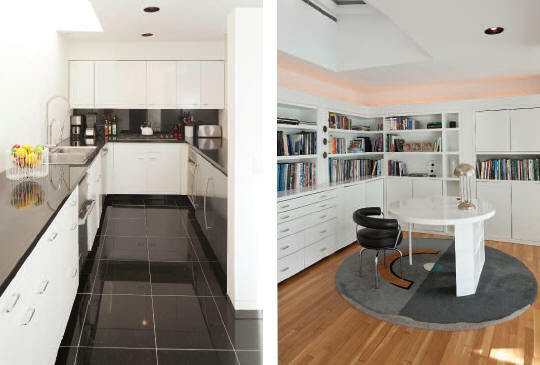 In 2008, the client hired architect Deborah Berke, bottom photo, and the house and adjacent buildings were finally built. 2001 - aka The Santa Barbara House, Santa Barbara CA. Unbuilt. 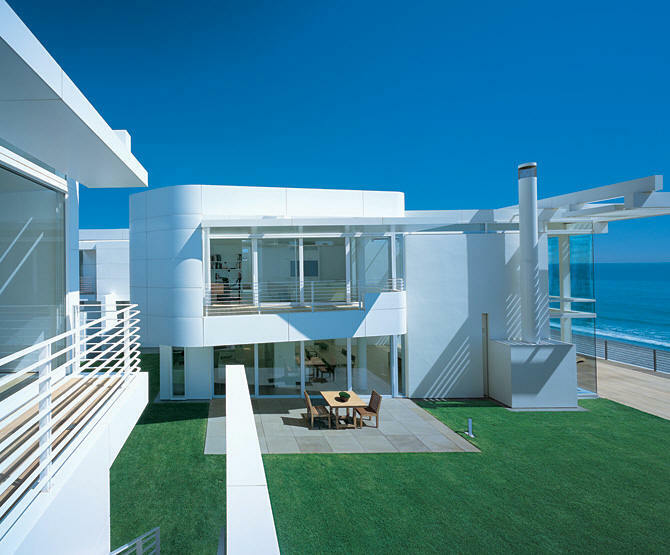 2001 - The Eli and Edythe Broad Residence, aka the Southern California Beach House, 21958 Pacific Coast Hwy, Malibu CA. 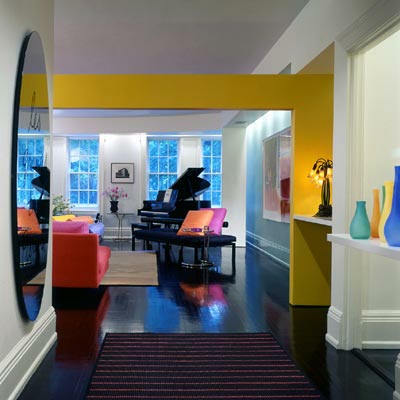 Interior design by Rose Tarlow. Commissioned 1999. 2002 - 173 Perry Street, New York NY. 14 condos, each a full floor. It's the building on the left. 2002 - 176 Perry Street, New York NY. 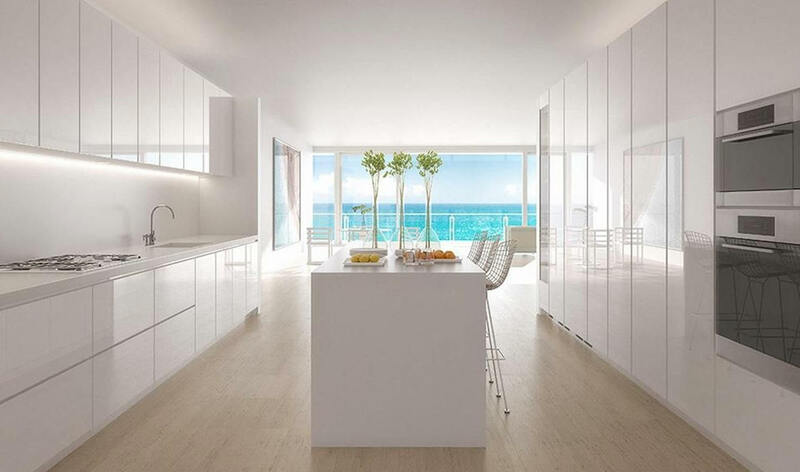 14 condos, each a full floor. It's the middle building. 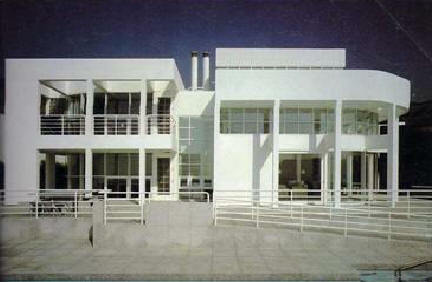 The right building was also designed by Meier, see 2005 entry below. 2003 - The Nancy Englander/Harold Williams Family Trust House, aka Son Soreno, aka the Santa Ynez Residence, 6660 Happy Canyon, Santa Ynez CA. 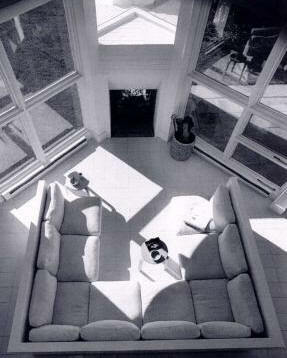 The project architect was Michael Palladino. Commissioned 1999. 166 acres. For sale on and off since 2010. 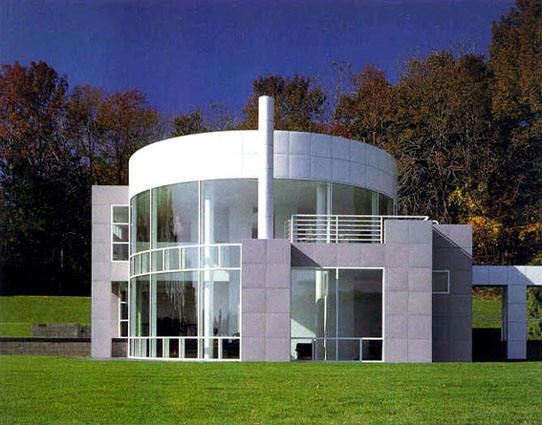 2003 - The Suburban House Prototype, Concord MA. Unbuilt. 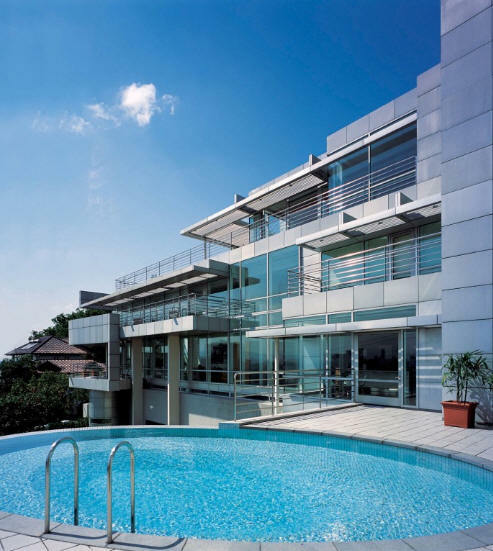 2003 - The Tan House, aka the Kuala Lumpur House, Kuala Lumpur, Malaysia. 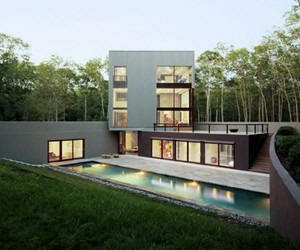 Project architect Michael Palladino. Commissioned 1997. Photos by Albert Lim. Won a 1997 AIA Gold Medal. 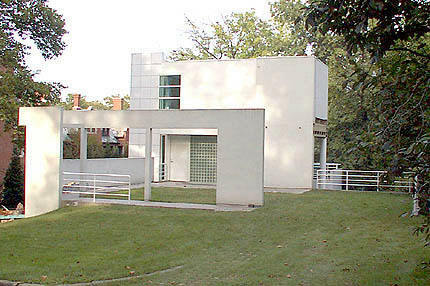 2004 - The Zaragoza House. Commissioned 2003. Unbuilt. 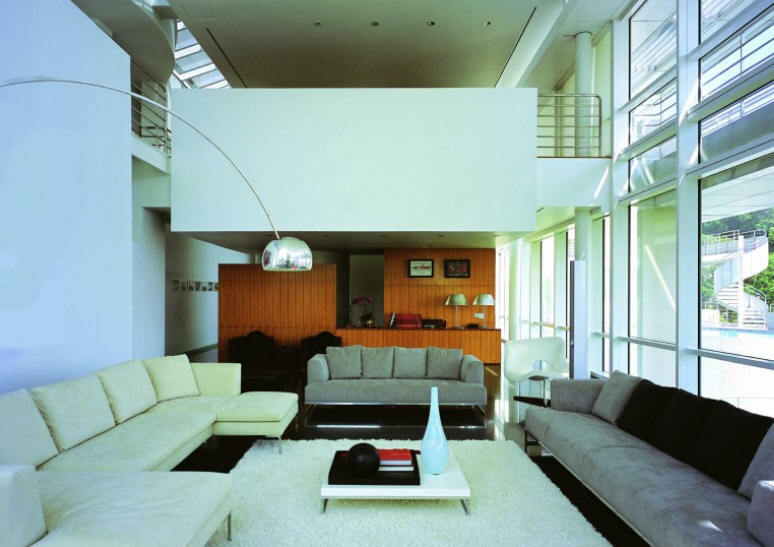 2004 - The Moss House, Los Angeles CA. Unbuilt. 2004 - The Sun Valley House, Sun Valley ID. Unbuilt. 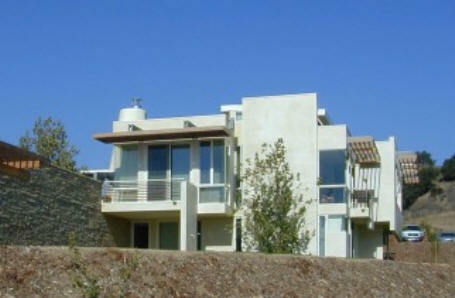 2004 - aka the Spyglass Hill House, Corona Del Mar CA. Unbuilt. 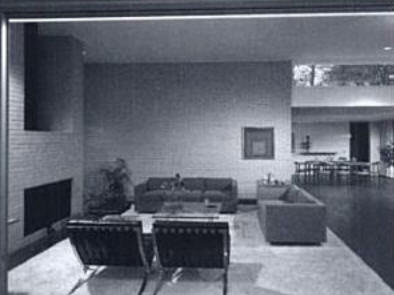 Project architect was Michael Palladino. Commissioned 2002. 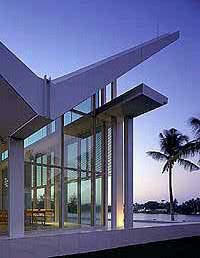 2005 - The Reed Krakoff Residence, aka the Southern Florida House, Southern Ocean Boulevard, Palm Beach FL. Unbuilt. Commissioned 2004. 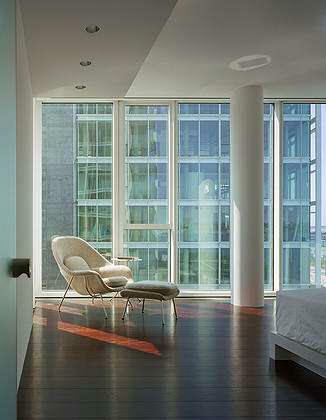 In 2008, Meier filed a land lien for $550,000 for more than $1 million in unpaid design fees. As of 2009, the lot was for sale. 2005 - 165 Charles Street, New York NY. 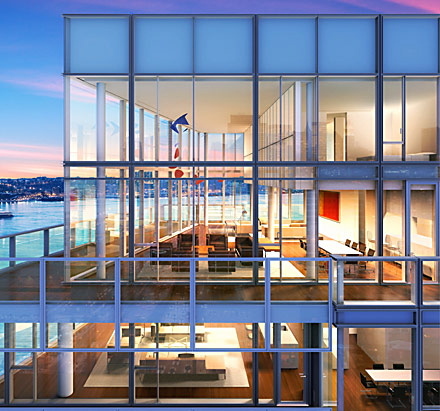 The penthouse, shown above, is 4200sf on two levels. 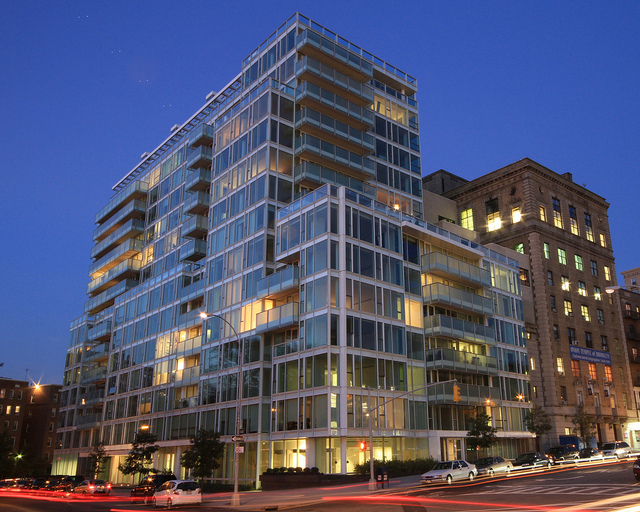 There are about 30 condos on 16 floors, but many were merged to create larger units. 2005 - The Playa Grande Resort and Artist Colony, Dominican Republic. Meier and other New Yorkers Charlie Rose, Fareed Zakaria, Alex von Furstenberg, Lela Rose, Bronson van Wyck, and Moby see the retreat as a "creative person's utopia," vowing "we are going to keep it bohemian, and not filled with dentists who got lucky in the stock market." 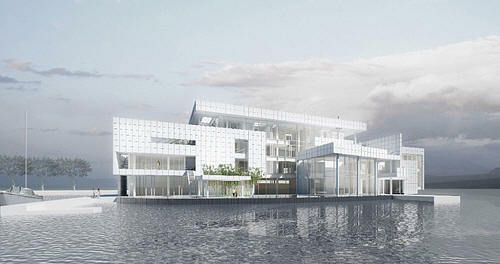 Unbuilt as of 2011. 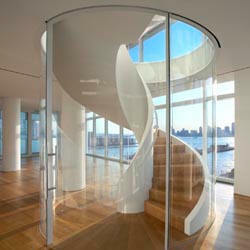 2006 - The Bill Joy Apartment, floors 9 and 10 at 176 Perry Street, New York NY. Commissioned 2001. Photos by Scott Frances/ESTO. Joy also bought the 8th floor. 2006 - The Dubai Palace, Dubai UAE. Unbuilt. 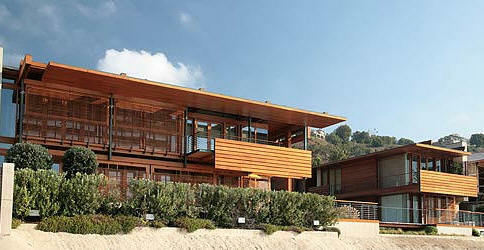 2006 - The Peter Morton Residence, aka Malibu Beach House, 22258 and 22310 Pacific Coast Highway, Malibu CA. Commissioned 2003. A departure for Meier: wood, specifically teak. 7,000 sf in several buildings. The guest wing is separated from the main house by a courtyard. Renovated in 2013. 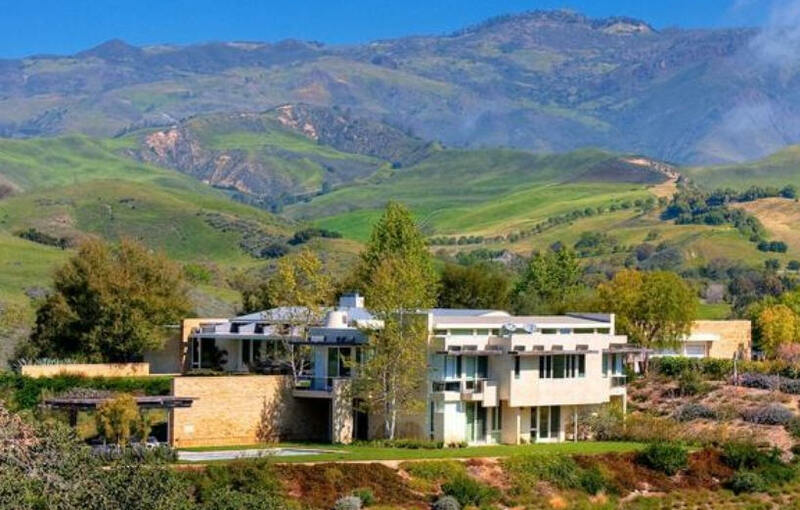 Sold in 2018 to Michael S. and Iris Smith for $110M, a world record price for a single-family house in LA county. 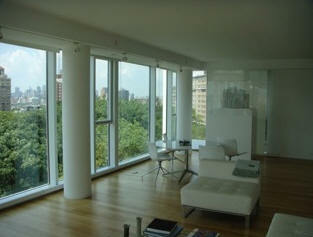 2006 - The Michael Kojaian Apartment, 5th floor of 176 Perry Street, New York NY. Commissioned 2001. Photos by Scott Frances/ESTO. 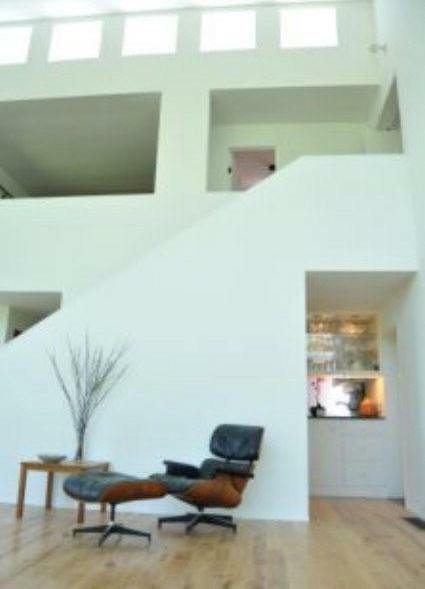 2006 - The Berg Residence, aka Canyon View House, Los Angeles CA. Unbuilt. 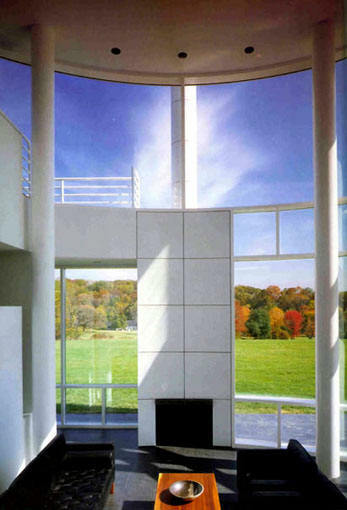 2007 - The Sagaponac House, aka The Richard Meier House, aka The Cube House, Wainscot NY. 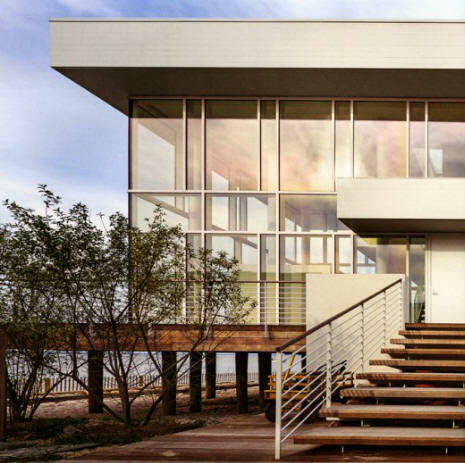 This house is often attributed to Meier but was actually designed by Calvin Tsao of Tsao and McKown Architects, chosen by Meier. 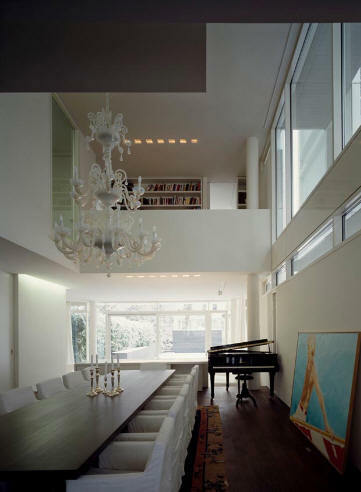 Won a 2009 AIA Housing Award. 4500 sf, comissioned 2002. 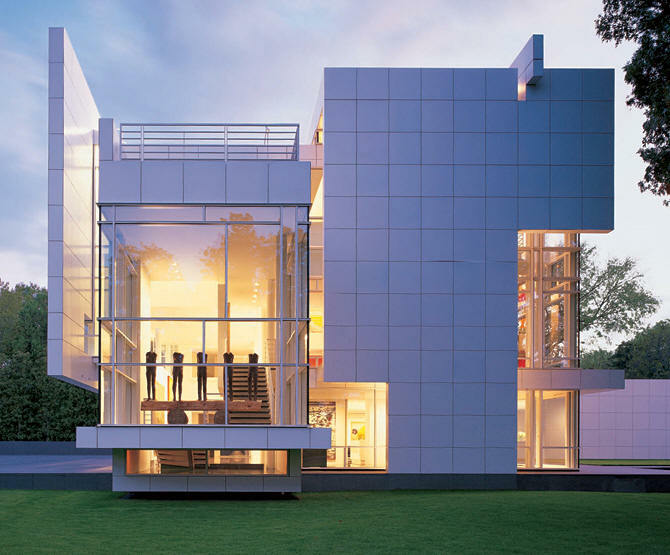 In 2001, the late Harry (Coco) Brown Jr. recruited Meier to help lure architects, many famous, through masterplanning 32 modern, high-end residences for a 72-acre plot of land in Sagaponac near Southampton on Long Island. By early 2011, only eight were built and only seven had sold. 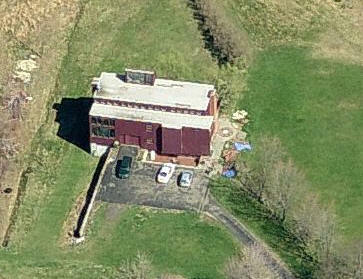 Brown died in 2005, and the property was sold to new partners. 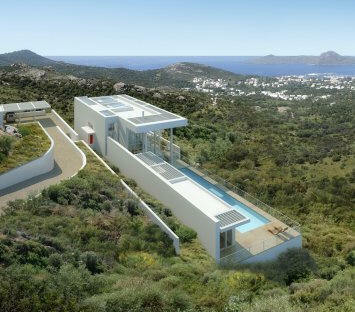 Construction was underway on a ninth house as of summer 2011 designed by Los Angeles architect Stephen Kanner. Sold in 2016 to Robert M. Johnson. 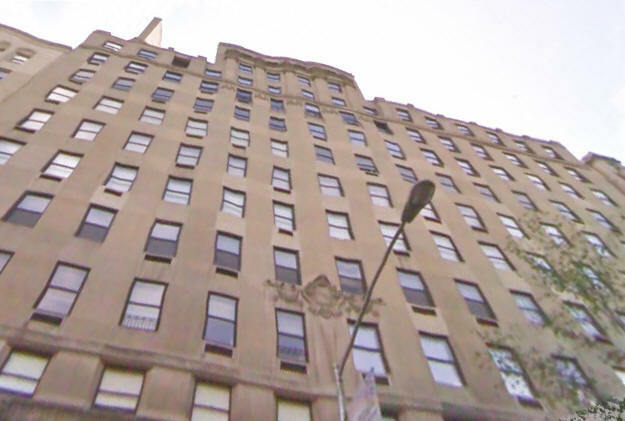 2007 - The Eli and Edythe Broad Apartment, aka the Fifth Avenue Apartment, aka the Midtown Apartment, located on a complete floor of the Sherry-Netherland Hotel, 781 5th Avenue, New York NY. 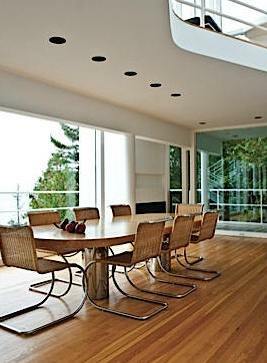 Interiors by Rose Tarlow. Built by Jim Scott. Commissioned 2006. For sale in 2011. Around 2008 - The Joanne Sorensen Siegel Apartment Renovation, 781 Fifth Avenue #704, on a corner of the Sherry-Netherland Hotel, New York NY. One bedroom. Features a 23-ft walk-in closet. Sold in 2012 to AF Holdings. 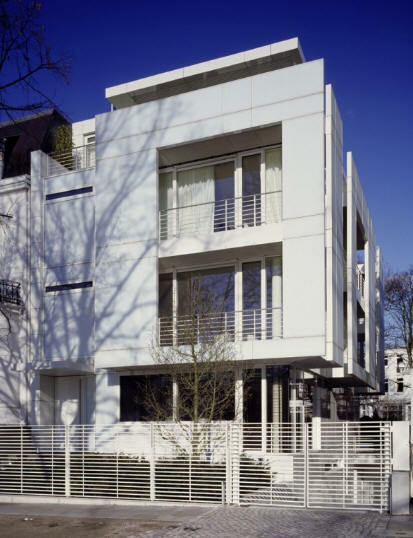 2008 - The Rickmers House, 8 Leinpfad, Hamburg, Germany. Lakefront. Commissioned 2002. 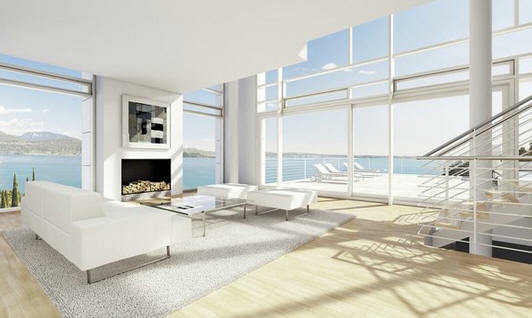 Designed for the owner of Rickmers Reederei, GmbH & Cie, one of Meier's office clients in Hamburg. Bottom two photos by Klaus Fromm. 2008 - aka Shenzhen Villas, five houses in Dameisha, Shenzhen, China. Commissioned 2005. 6000-10000 sf each. 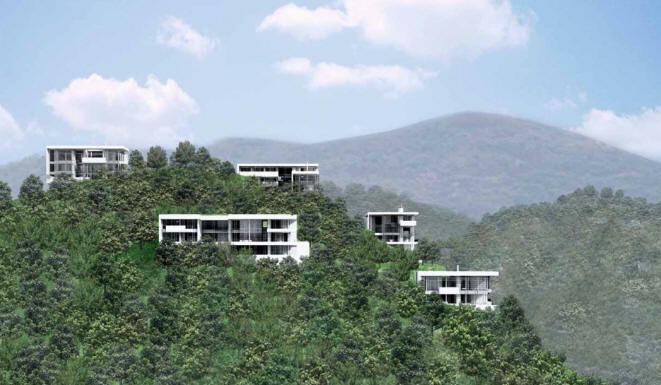 As of 2017, unbuilt. 2008 - aka Jesolo Lido, Via Carlo Scarpa, 3, 30016 Jesolo VE, Italy. Commissioned 2003. Twenty apartments and many poolside condos as part of a larger complex. 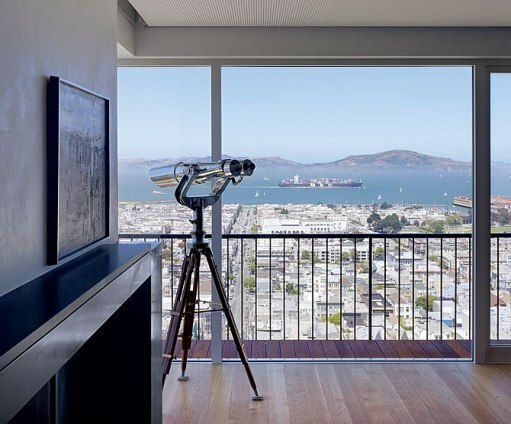 2008 - The Shelby and Frederick Gans House, aka the Pacific Heights Residence, 2288 Broadway Street #7, San Francisco CA. Located on the seventh floor of a former industrial building. Commissioned 2004. Photos by Tim Griffith. 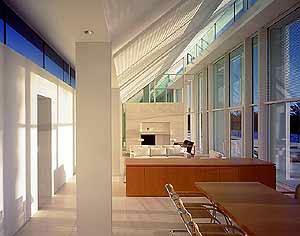 Project architect Michael Palladino. Interior design by Rick Irving. 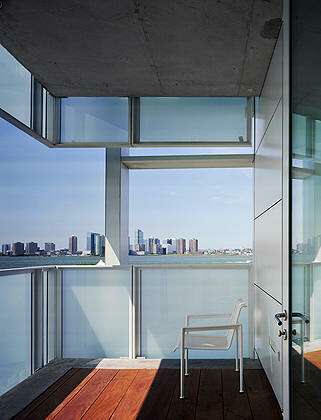 Featured in Architectural Digest in 2009. 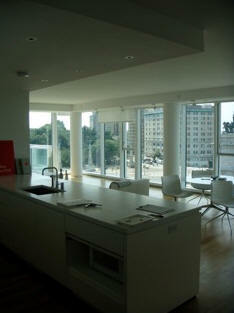 2008 - The Richard Meier Condos on Prospect Park, 1 Grand Army Plaza, Brooklyn NY. Bottom two photos by Kevin Cundiff. 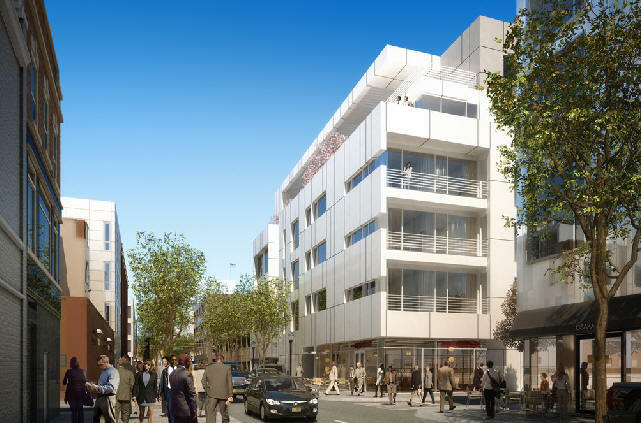 2009 - aka 9900 Wilshire, 9900 Wilshire Boulevard, Beverly Hills CA. 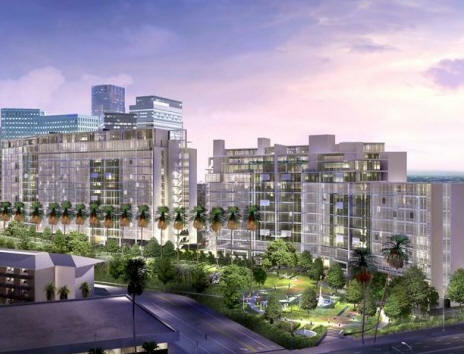 252 condos in a variety of buildings. Commissioned 2004. Unbuilt. 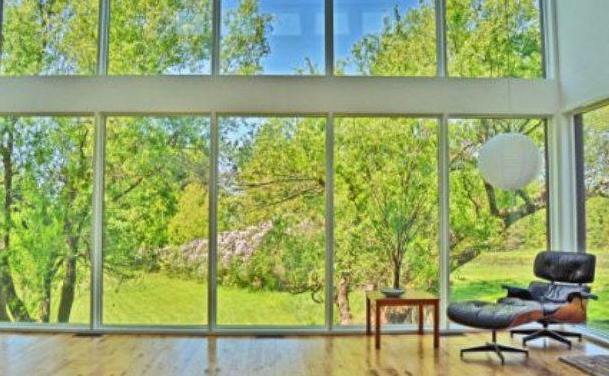 2010 - The Bruce Sherman Residence, aka the Dune Road Residence, 22 Dune Road, Quoque NY. Unbuilt. 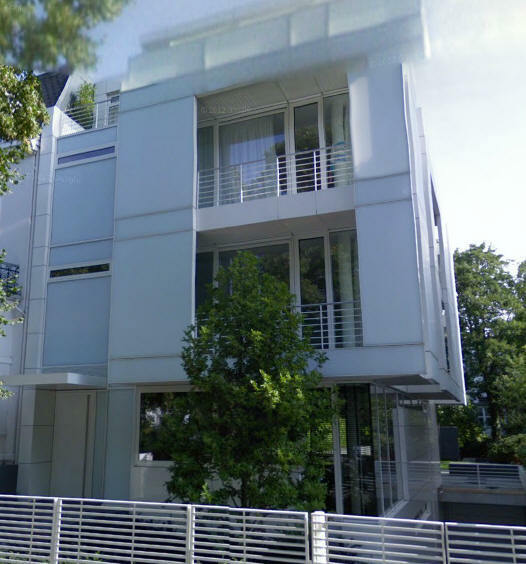 2011 - The O'Donnell-Pommerell House, aka the Luxembourg House, 8 Rue de l'Ernz, Eisenborn, Luxembourg. Commissioned 2007. 979 sm. 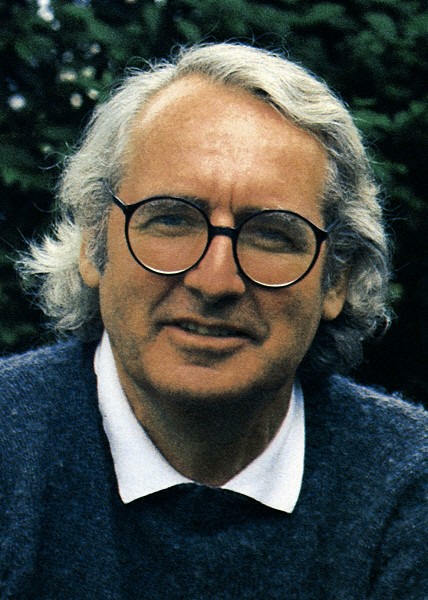 Project designer Bernhardt Karpf. 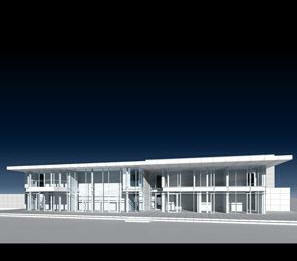 Designed with Bob Strotz Architecture. Engineering by Jean Schmit. Photos by Henry Bourne. 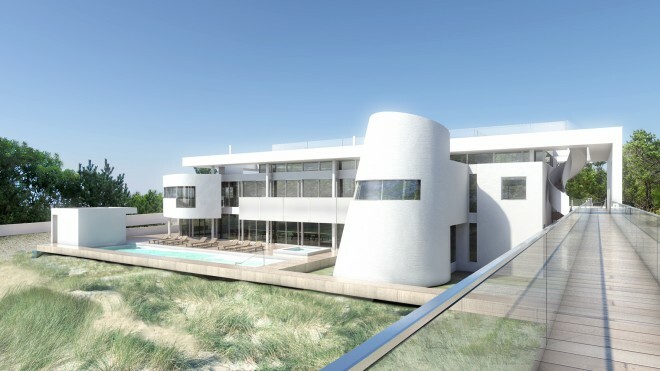 2011 - The Beach House Condominiums, aka Beach House Surfside, 9449 Collins Avenue, Surfside FL. Commissioned 2004. Unbuilt. Developers filed bankruptcy. 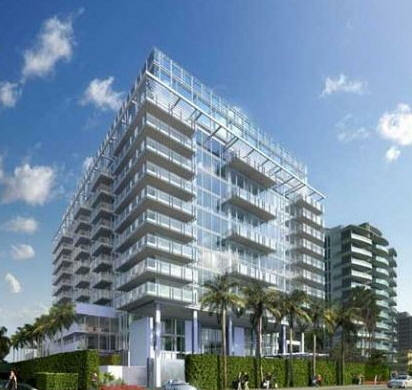 2014 - The Beach House Condos, 9000 and 9011 Collins Avenue, Surfside FL. 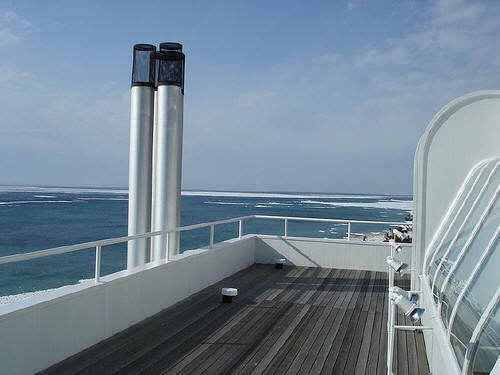 Part of the Surf Club Four Seasons, the hotel was redesigned and two 12-story condos were designed by Meier. 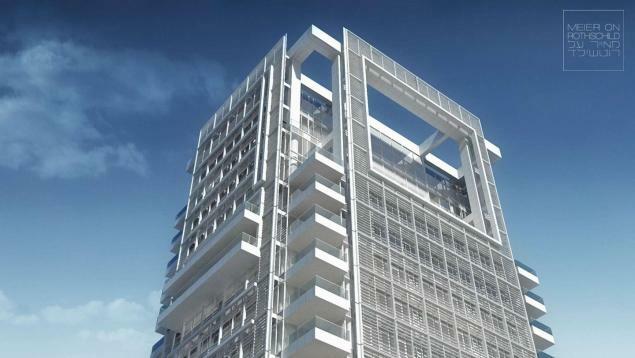 2012 - The Meier-on-Rothschild Condos, aka the Palace in the Sky, Tel Aviv, Israel. Commissioned 2007. 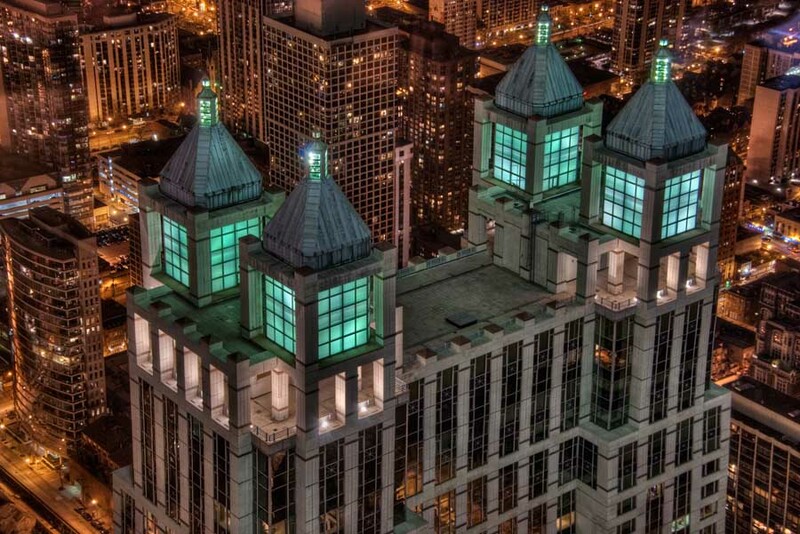 These are the most expensive condos in the country. 2012 - Tianjin Villa, Tianjin, China. Commissioned 2008. 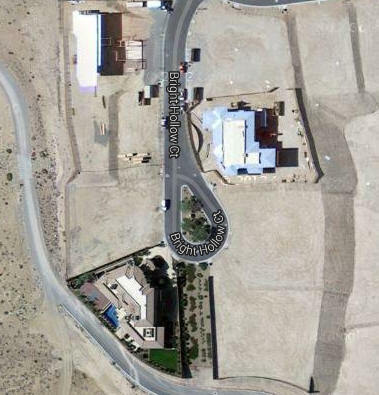 2013 - The Thomas (Tom) Kaplan House, aka the Las Vegas House, 1 Bright Hollow Court, Summerlin South NV. Built by Bugbee Construction. 2014 - The Michael (Breck) Breckinridge and Georgia Leigh Irwin Eisner Addition, aka Scenario Lane Addition, 1100 Scenario Lane, Los Angeles CA. Bottom photo by Michael Locke. 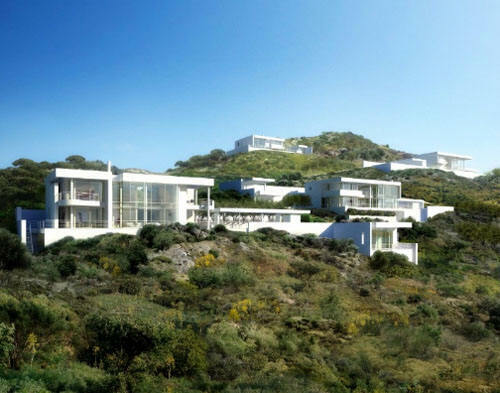 2014 - aka The Bodrum Houses, Yalikava, Turkey. Commissioned 2007. 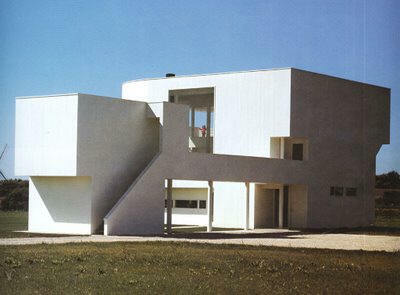 Project architect, Carlo Balestri. 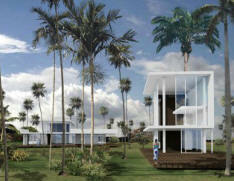 Initially there were five prototype houses; plans called for 21 total. 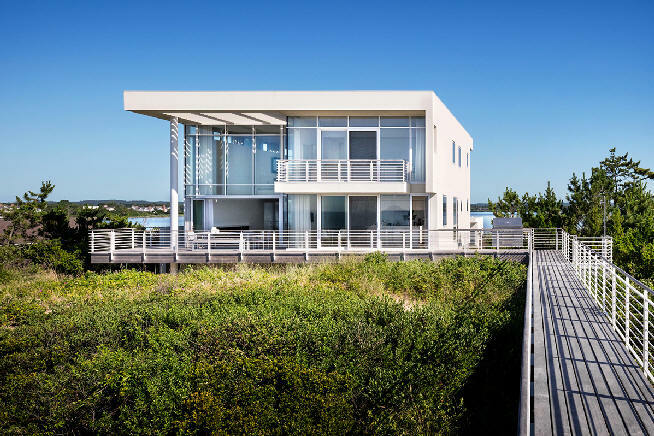 2014 - The Philip (Phil) and Lucy Suarez House, 15 Elm Walk Avenue, Fire Island, Bayshore NY. Built on the site of their house that burned down January 2011, bottom photo. 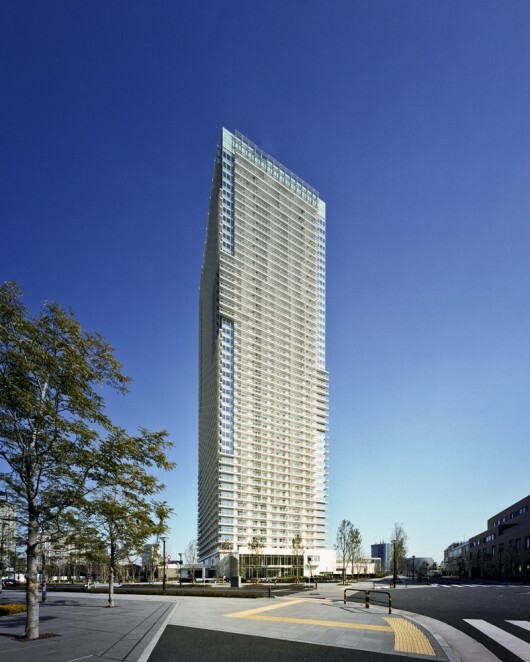 2015 - The Harumi Residential tower in Tokyo, Japan. Near the 2020 Olympic Village. There will be more towers. Unsure of status. 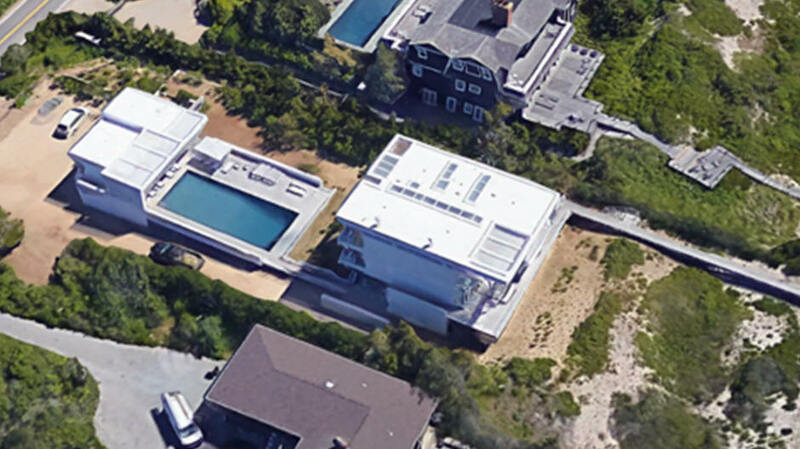 2015 - The Izak and Sarah Senbaher house, aka The Flying Point House, 1141 Flying Point Road, Southampton NY. Commissioned 2007. 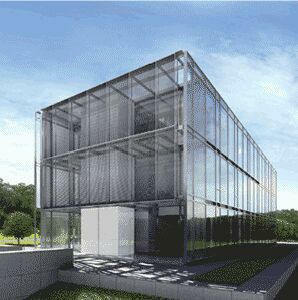 Project architect, Sangmin You. Bottom photo by Scott Frances. 2017 - The Rowan and Sunetra Sastry Atkinson House, aka the Handsmooth House, aka the Oxfordshire House, Urquhart Lane, Wallingford, Oxfordshire, UK. 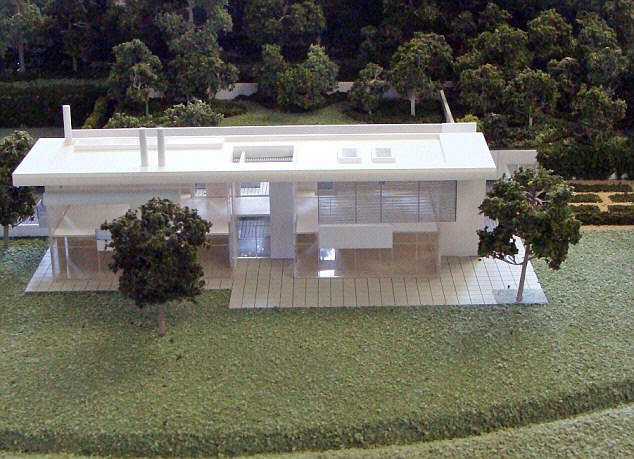 Meier's first house in the UK, commissioned around 2012. 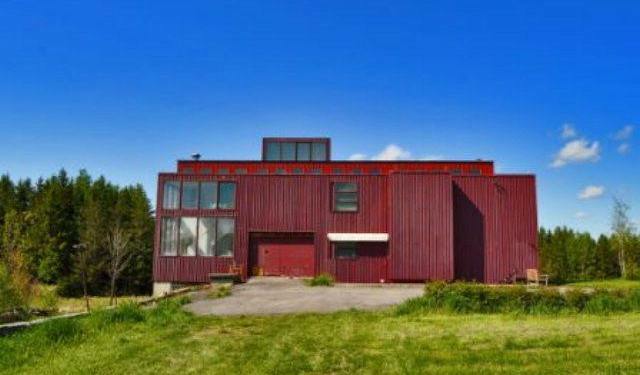 Three stories, 10,000 sf on about 16 acres. 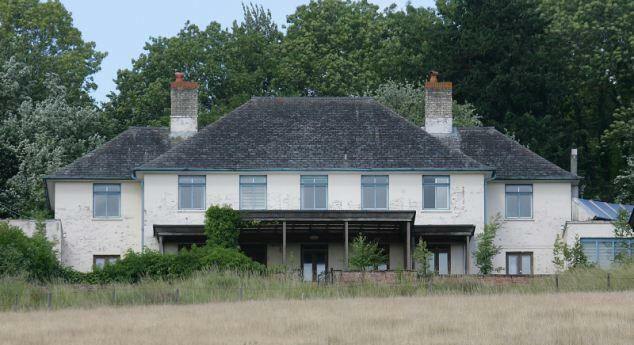 Atkinson demolished a 1930's manor home he bought in 2006 but never lived in, bottom photo. Top photo is the original scheme, since modified to produce the actual build, next photo. The Atkinsons separated around 2013 and divorced in 2015. 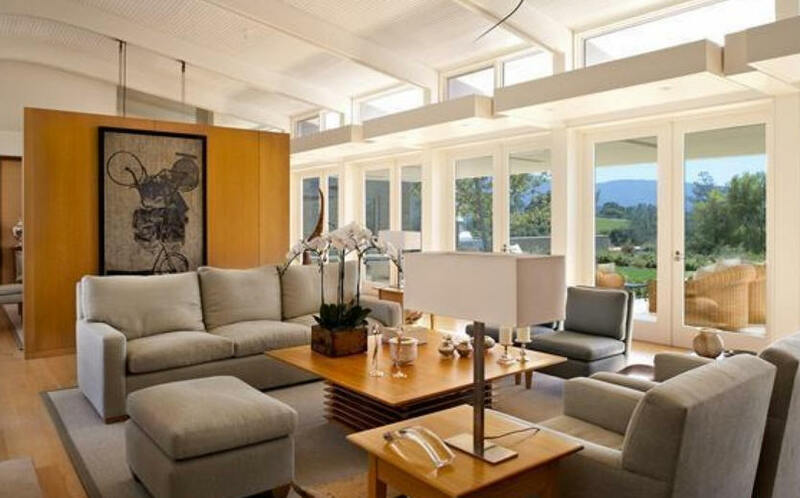 Features an atrium-style living room, roof solar panels, a secret garage in a grassy bank, tennis course, stables, and a two-story guest house. Featured in Architectural Digest, December 2016. Project architect, Kevin Baker. 2017 - The Villa Eden Gardone, on Lake Garda, just west of Barbarano, Italy. Commissioned 2010. 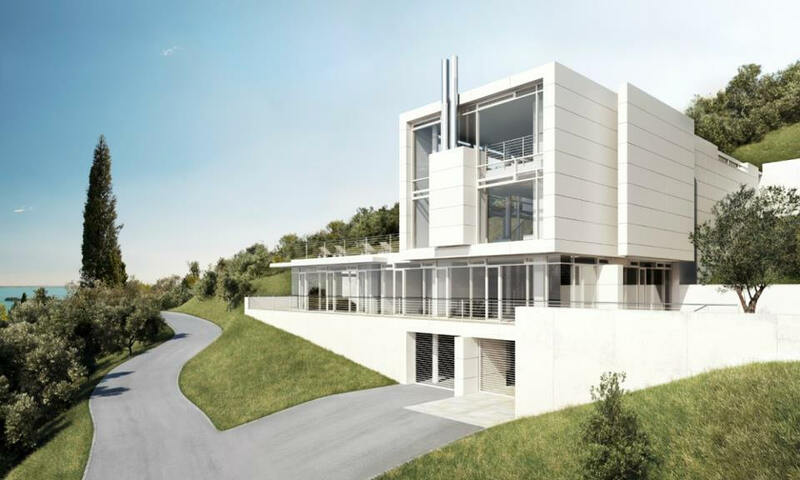 Created by the Signa Holding Group, an Austrian development company. 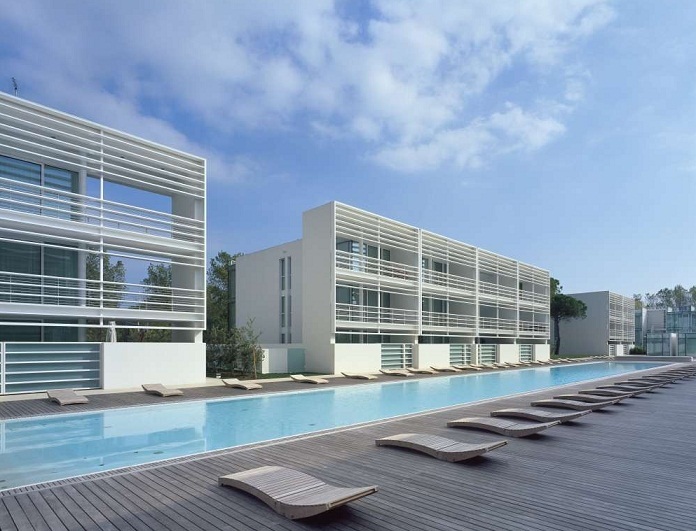 The group invested 65 million euros, or $83.8 million, to commission David Chipperfield, Matteo Thun, Richard Meier and the Austrian firm Sphere to design a community of 11 freehold villas and a four-apartment clubhouse. 2017 - The Montagnola Residence, 11 Via Castel, Montagnola (Collina d'Oro), Lugano, Switzerland. Commissioned 2011. 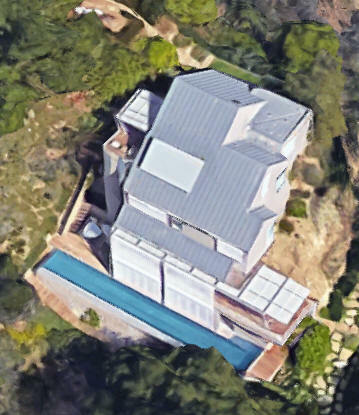 2017 - The Casey Wasserman House, aka the Foothill Road House, aka the Beverly Hills House, 911 Foothill Road, Beverly Hills CA. Commissioned 2007. Photo by Michael Locke. For sale in 2018 - for $125 million. 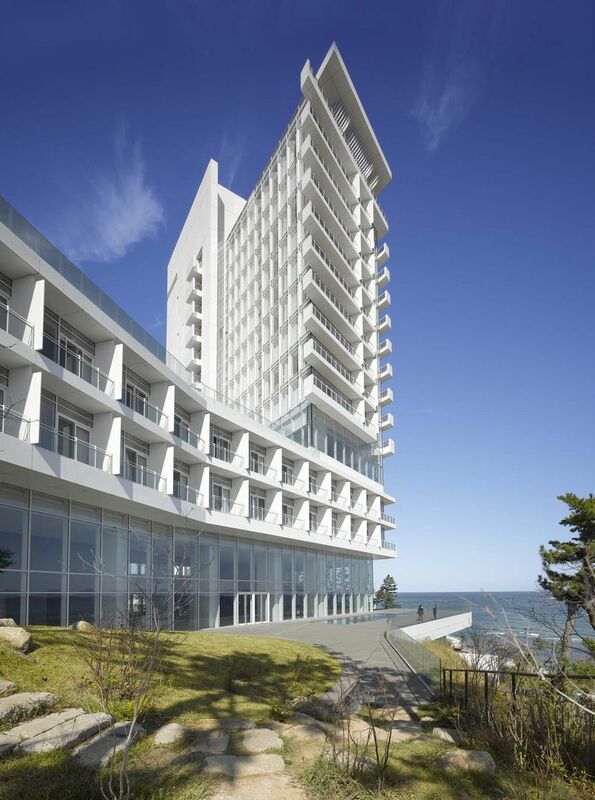 2017 - The Seamarq Hotel, Gangneung, South Korea. 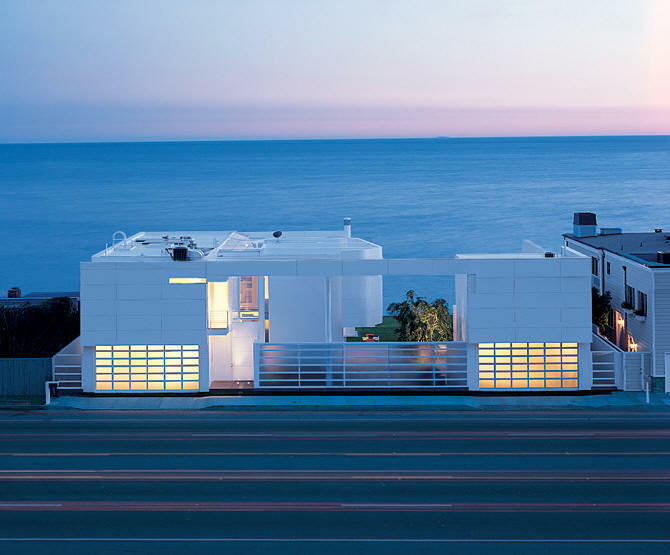 Sources include: MalibuComplete, Richard Meier and Partners, Blockshopper, Architizer, Essar Steel Richard Meier Exhibition; Carlo Balestri; Richard Meier Architect Volumes 1-5.